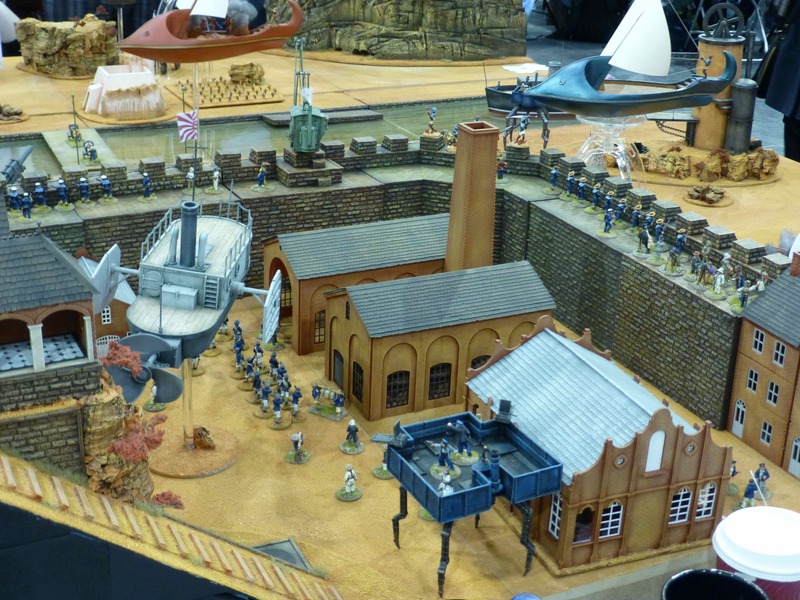 It always surprises me how many science fiction themed tables are present at Salute and 2013 was no exception. 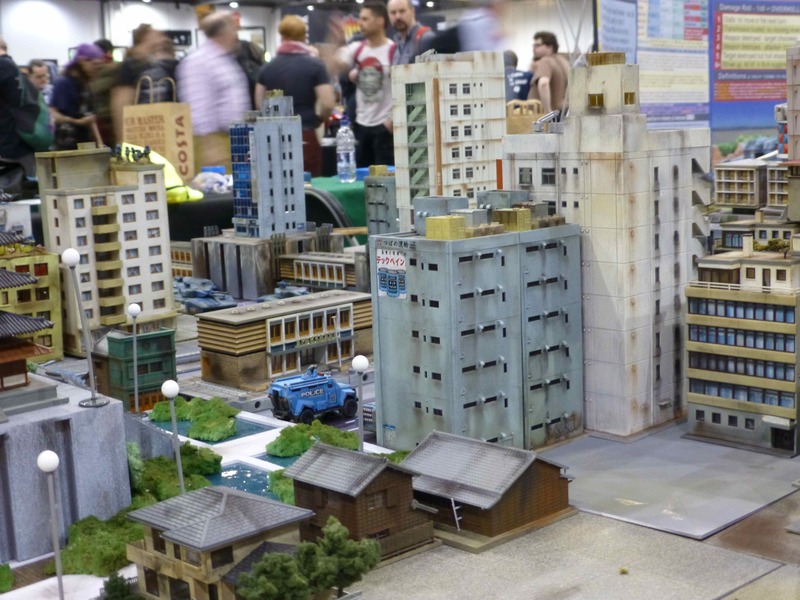 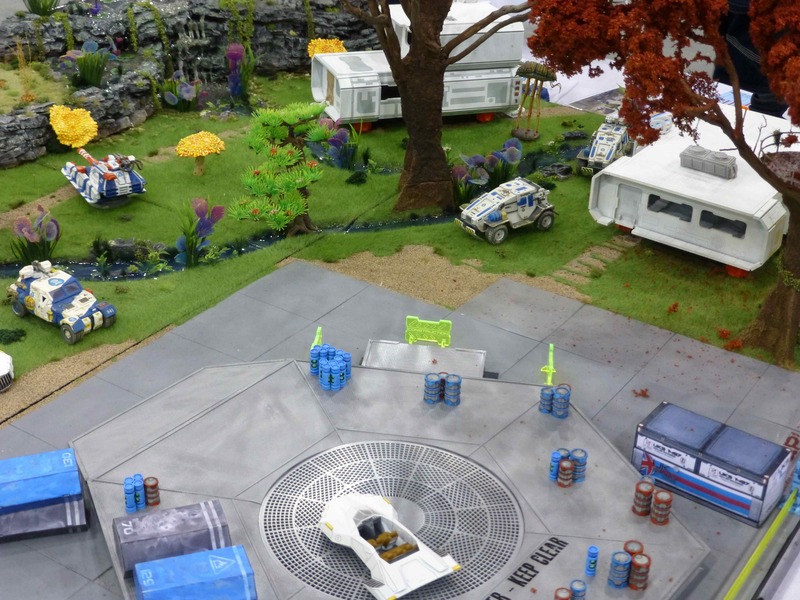 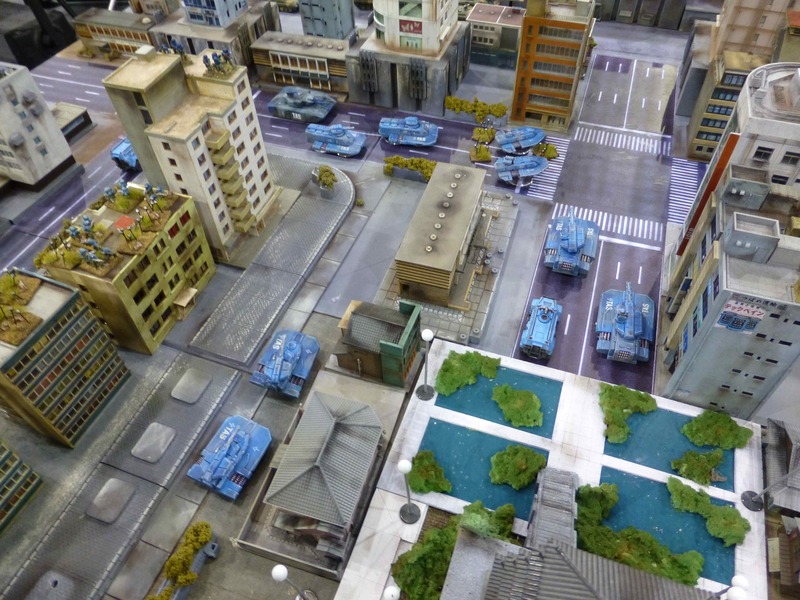 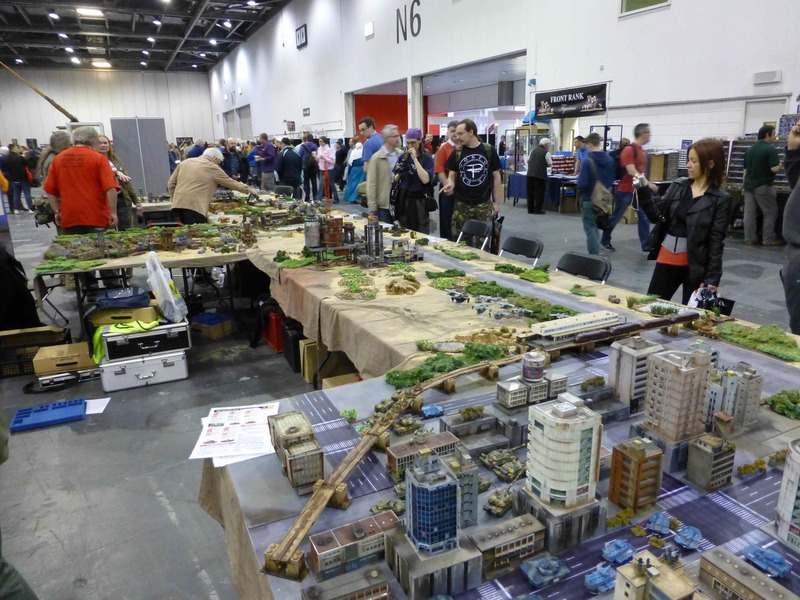 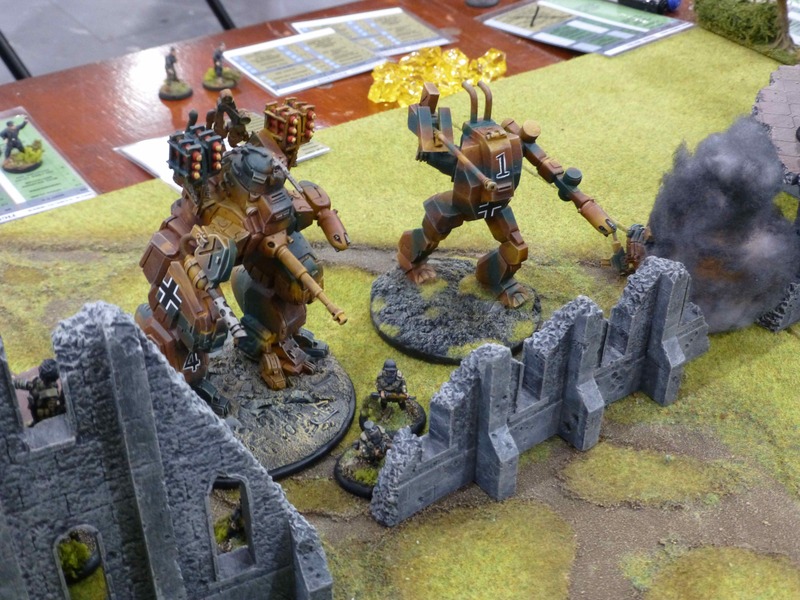 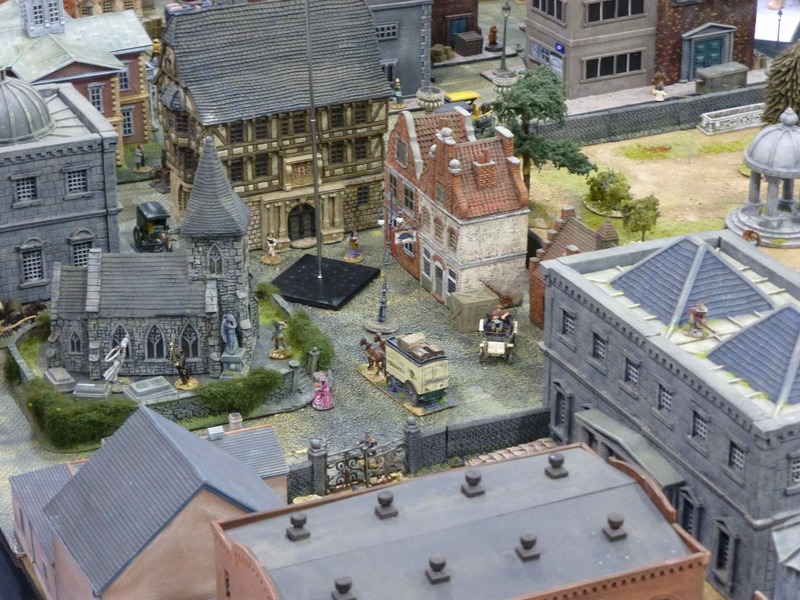 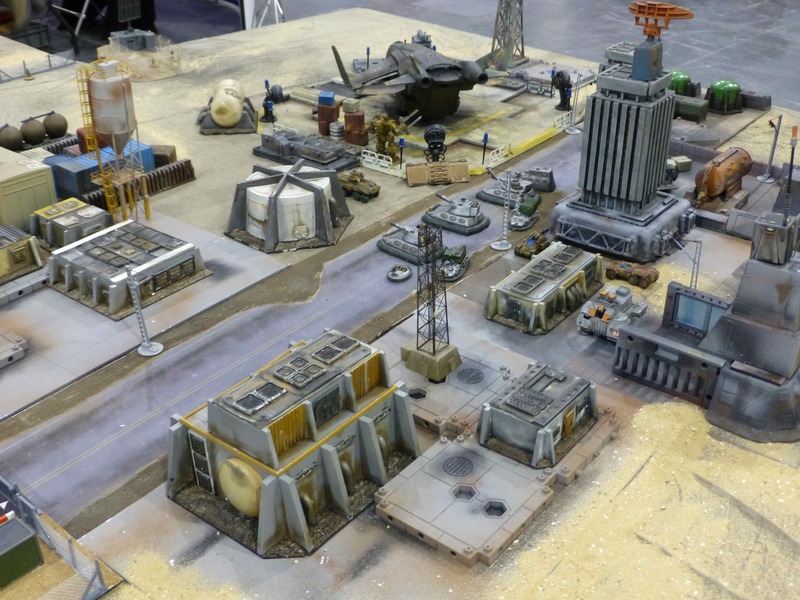 One of the largest sci-fi displays by the South London Warlords themselves was based on David Drake’s Hammer’s Slammers series of books which has spawned the tabletop games system The Crucible. 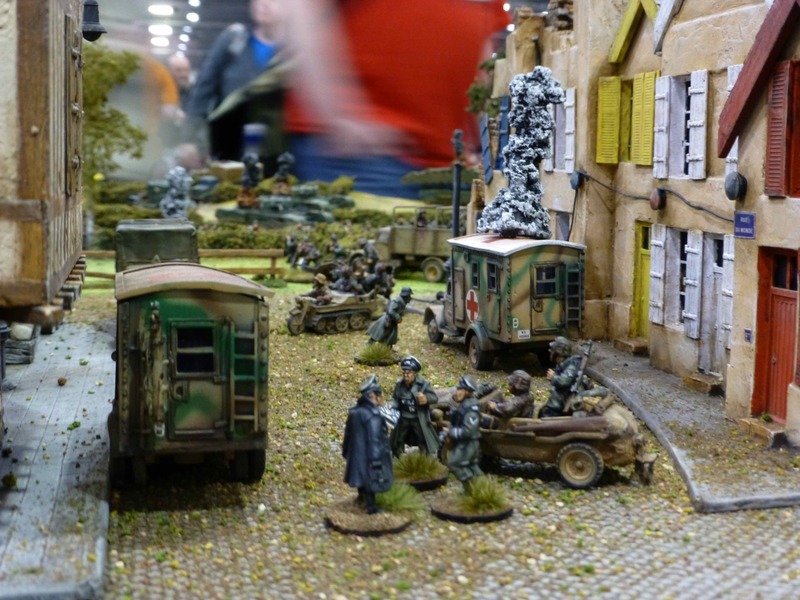 Mecha meets WW2 in West Wind Production’s Secrets of the Third Reich alternative pulp history. 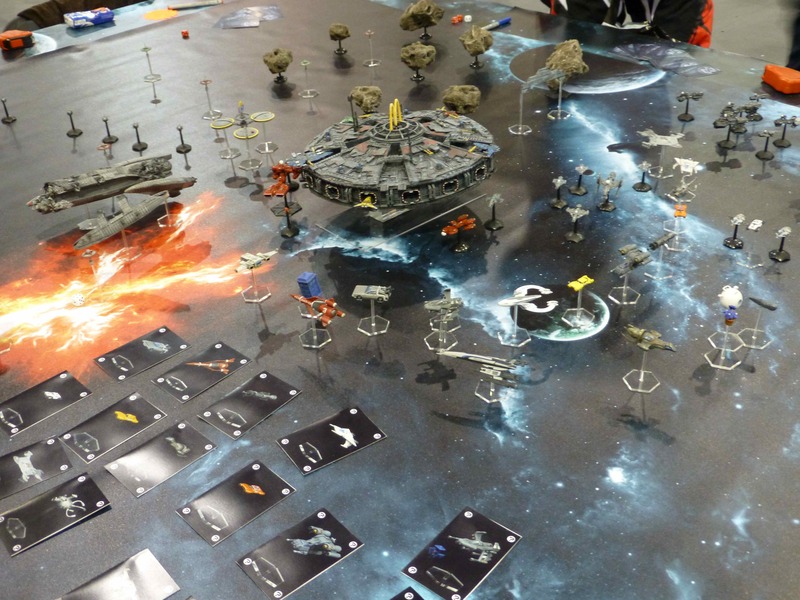 Mechworld put together a demo game of Full Thrust using self-built models of famous star ships from movies, television and novels. 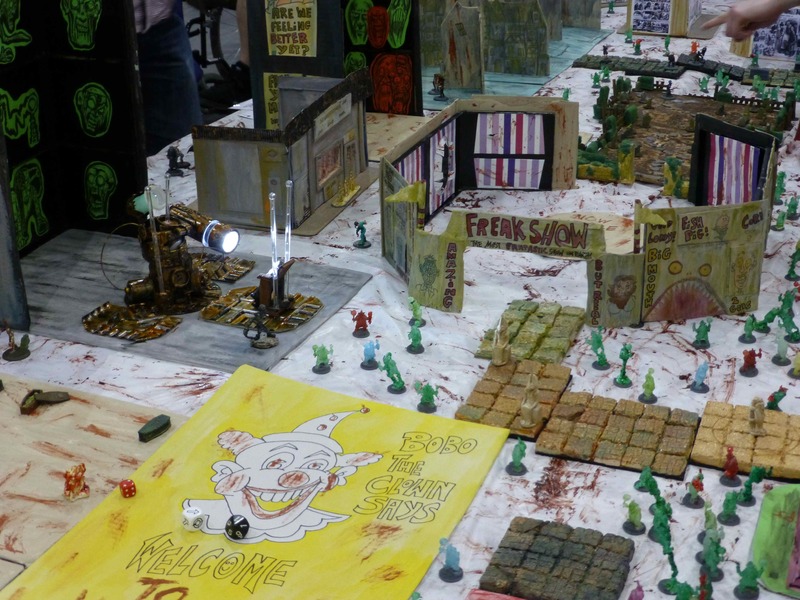 Frothers Unite attended with an eclectic mix of genre-bending games which I included here under sci-fi for lack of a more fitting term. 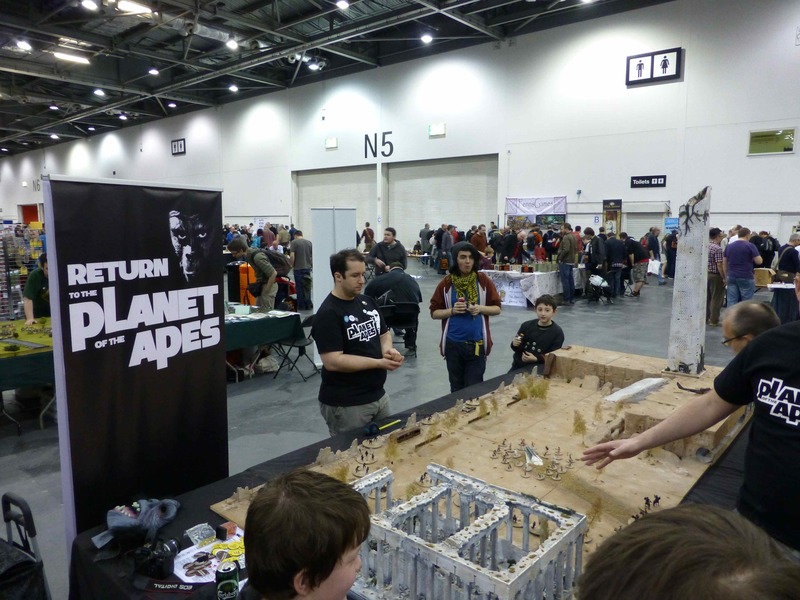 First off, Return to the Planet of the Apes, where “intrepid astronauts lead the remnants of humanity in a desperate battle against a gorilla army in the ruins of Washington DC”. 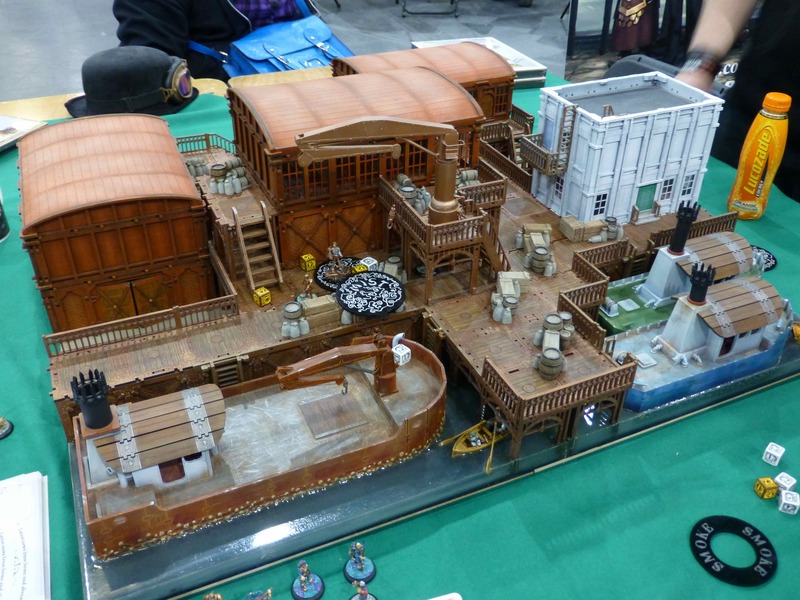 Unfortunately I didn’t take a close enough look to spot whether there was a Charlton Heston miniature. 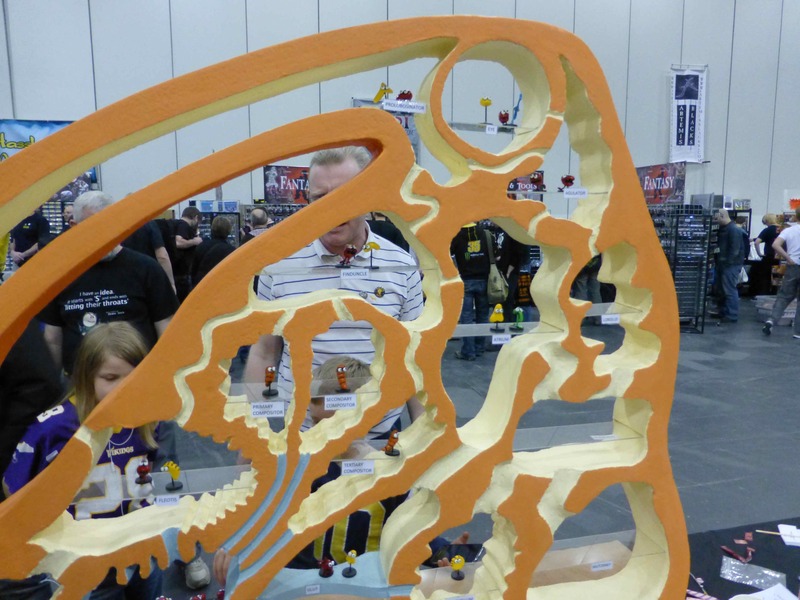 Snits Revenge, a “3D recreation of a classic, humorous game first printed in Dragon magazine. 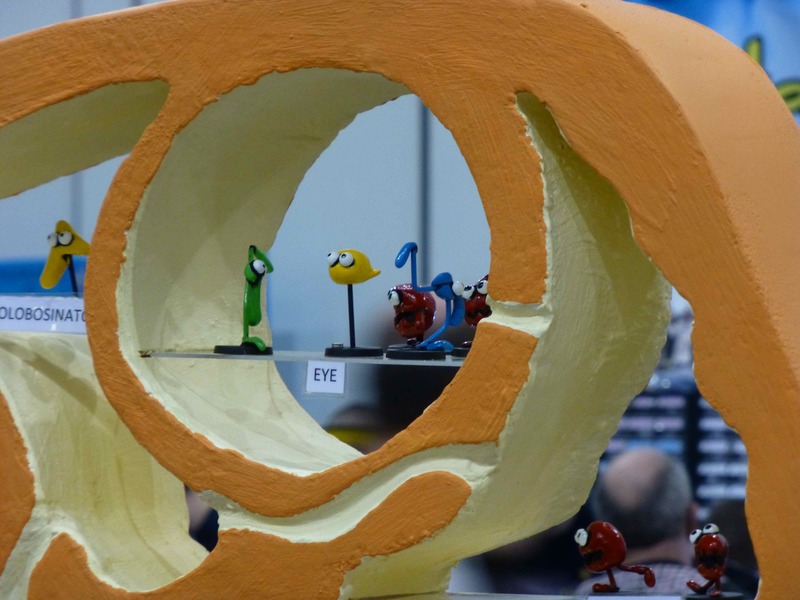 Snits Revenge is a a game involving biology where players defend a Bolotomus from the invading Snits”. 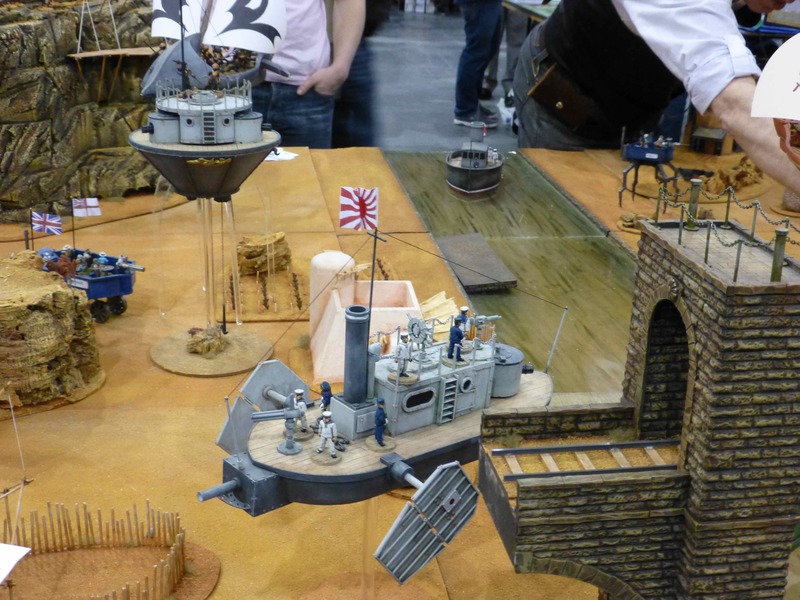 I’ve got to hunt down a PDF of the original. 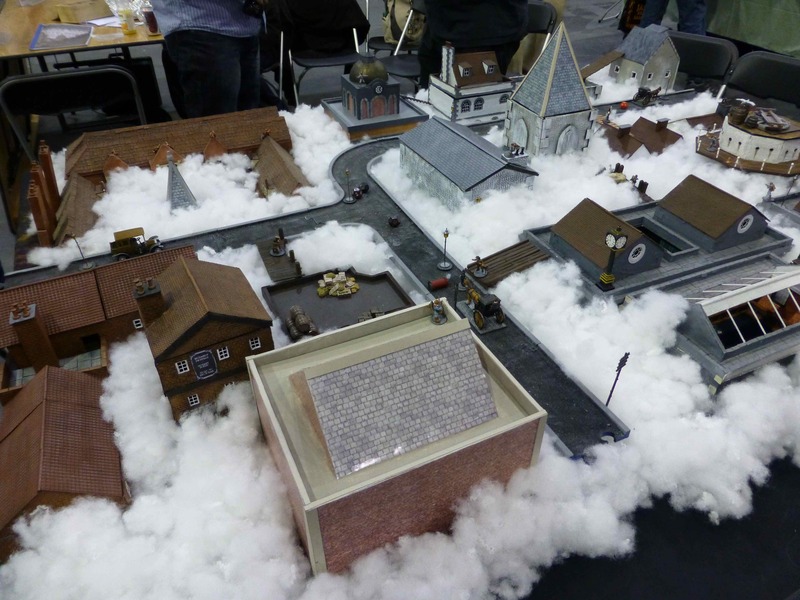 There were a myriad of other small participation games in all sorts of scales and styles, snapshots of just a few below. 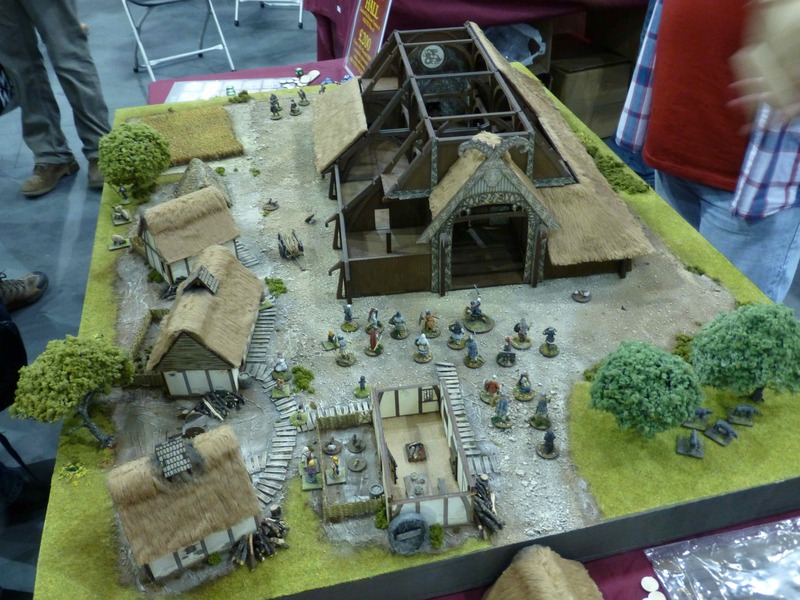 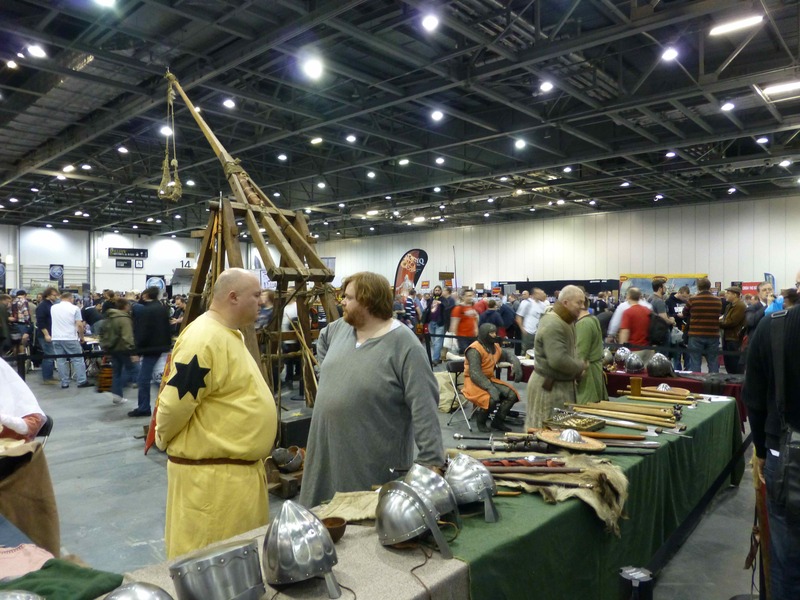 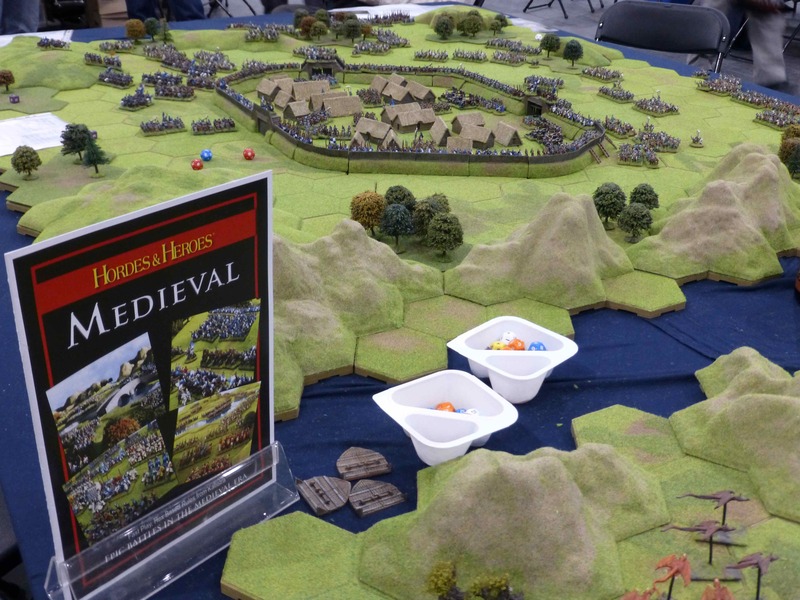 There wasn’t enough Ancients & Medieval on display at Salute 2013 for my liking. 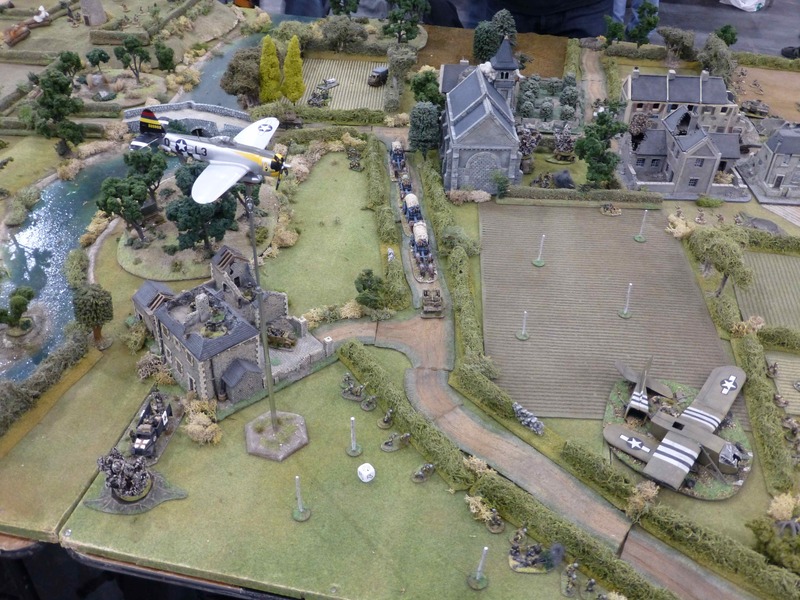 There isn’t enough anyplace, anytime for that matter. 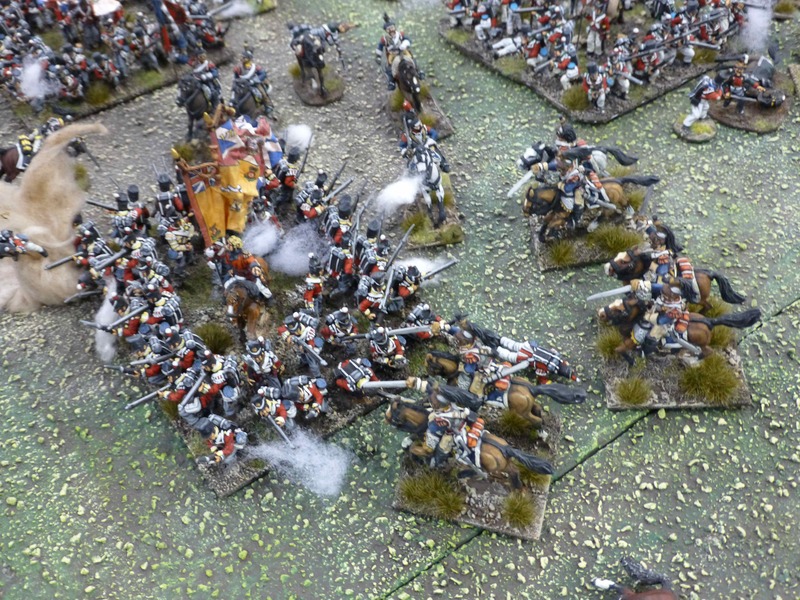 I took pictures of most of the valiant efforts I discovered and they make for a pretty varied lot. 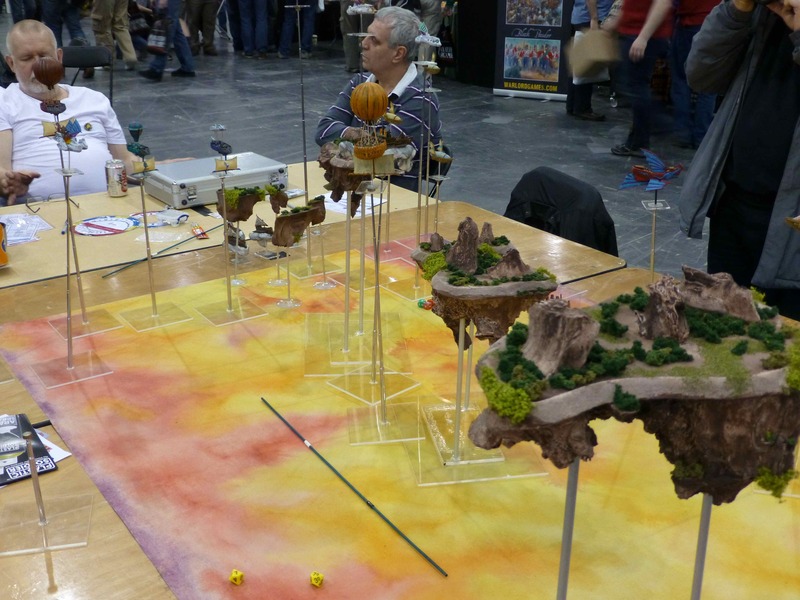 To start proceedings, a tribute to Ray Harryhausen in Fleeced! 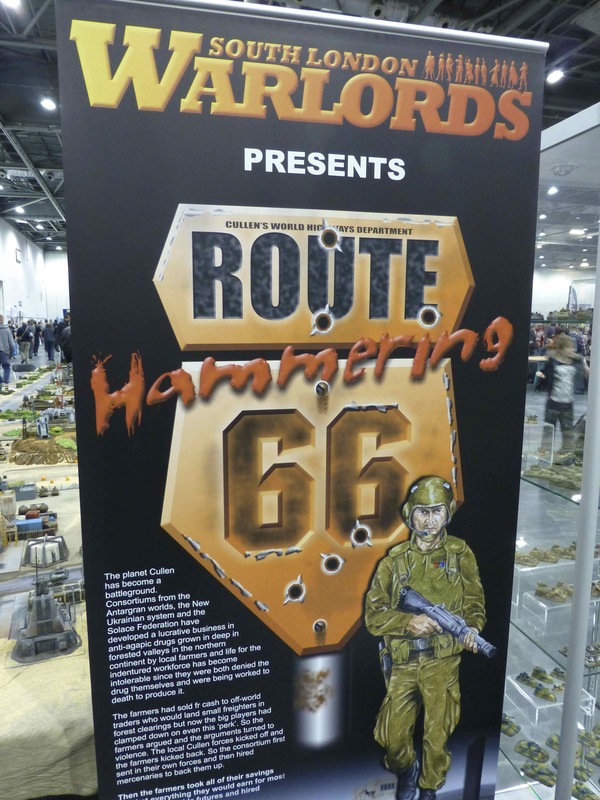 by the South London Warlords. 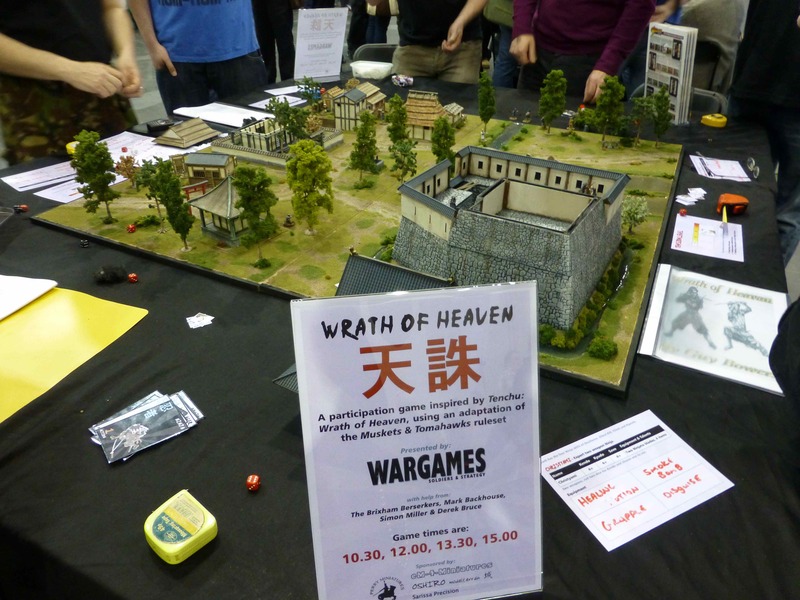 The game represents the final climatic battle between Jason, plus two other Argonauts against the “Children of the Night”. 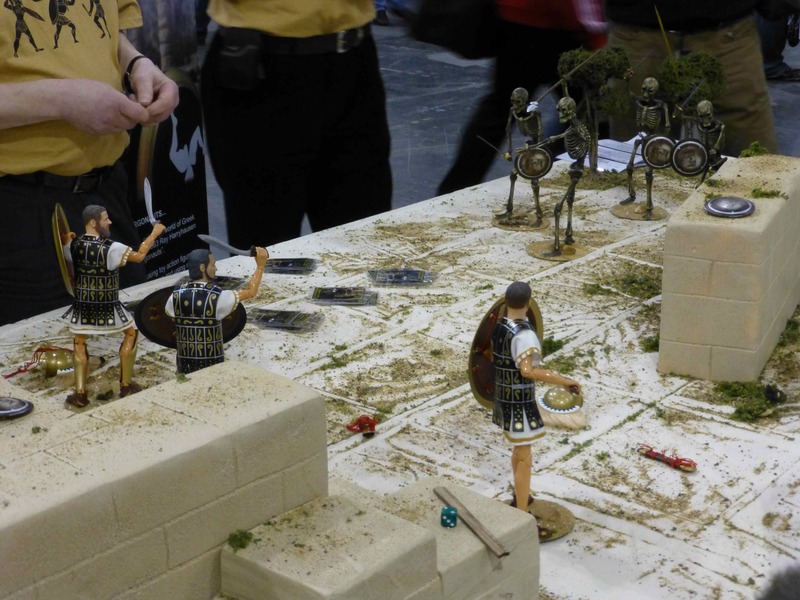 The figures are all accurate “collector” models based on Ray Harryhausen’s brilliant originals. 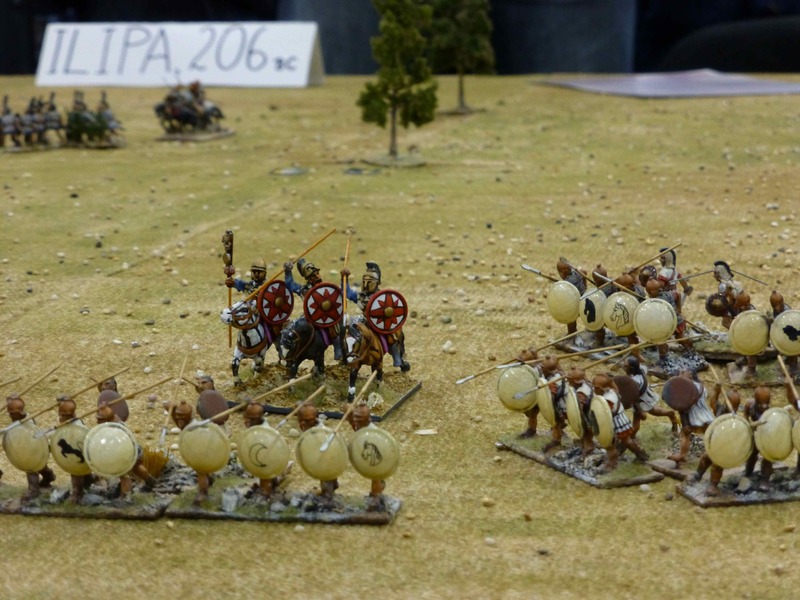 The Battle of Ilipa 206 BC during the Second Punic War. 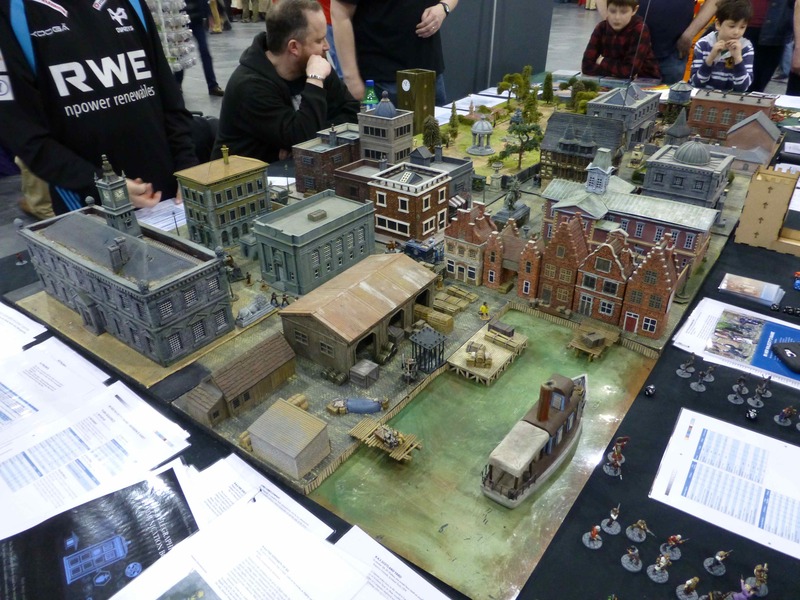 Unfortunately I can’t say who ran this or which games system was being used. 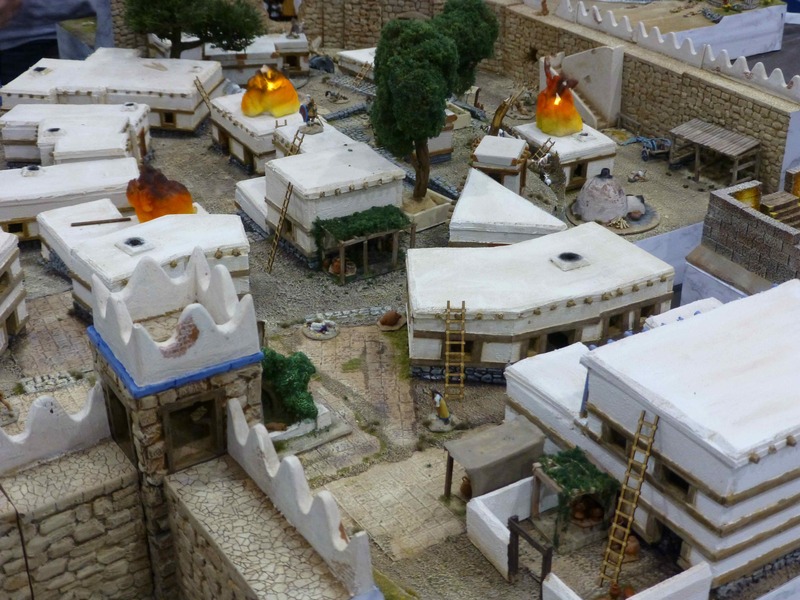 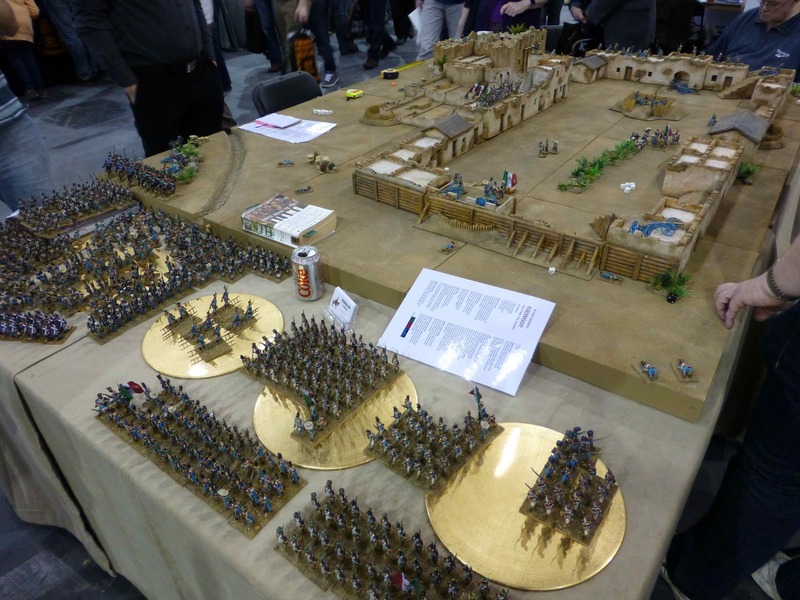 Greeks against Persians in a loose recreation of the Battle of Marathon 490 BC by Ancient & Modern Army Supplies. 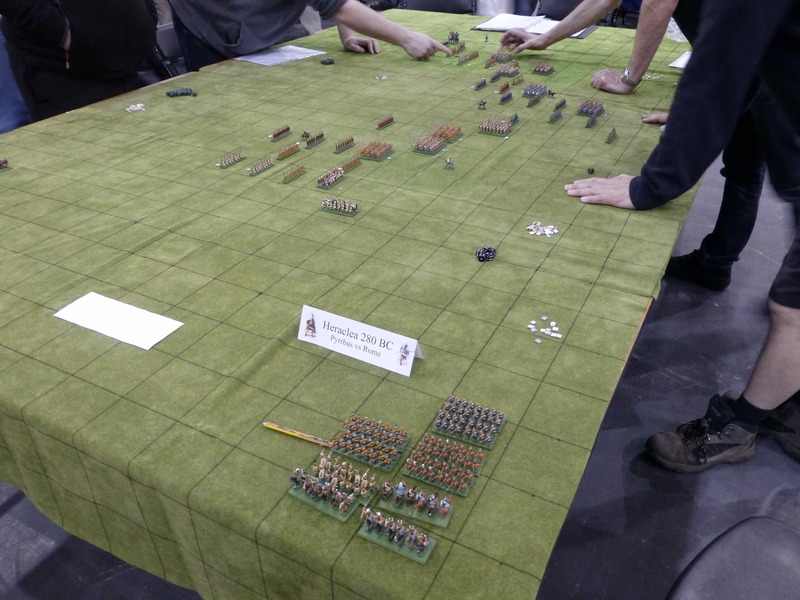 A Pyrrhic Victory – Heraclea 280 BC by the Oxford Wargames Society was played using house written rules and squares for ease of movement. 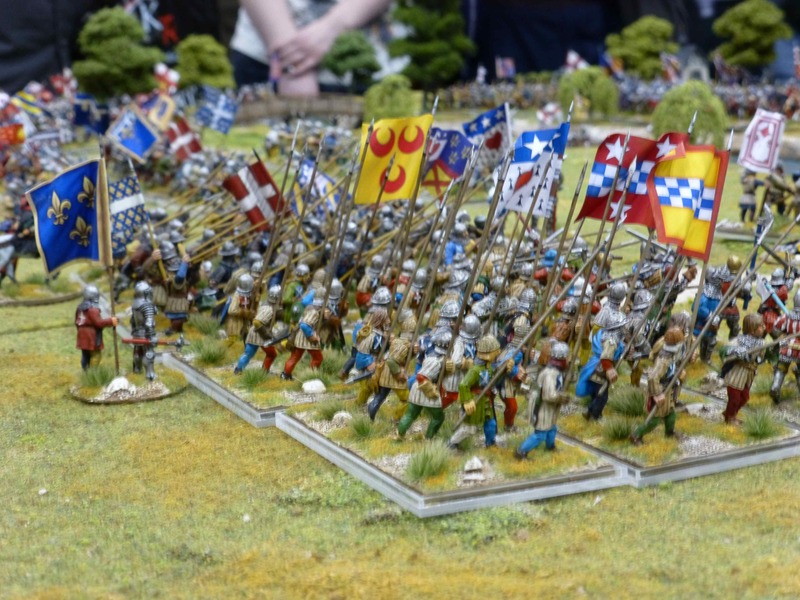 The Battle of Cravant 1423 during the Hundred Year’s War was recreated by the Lance & Longbow Society. 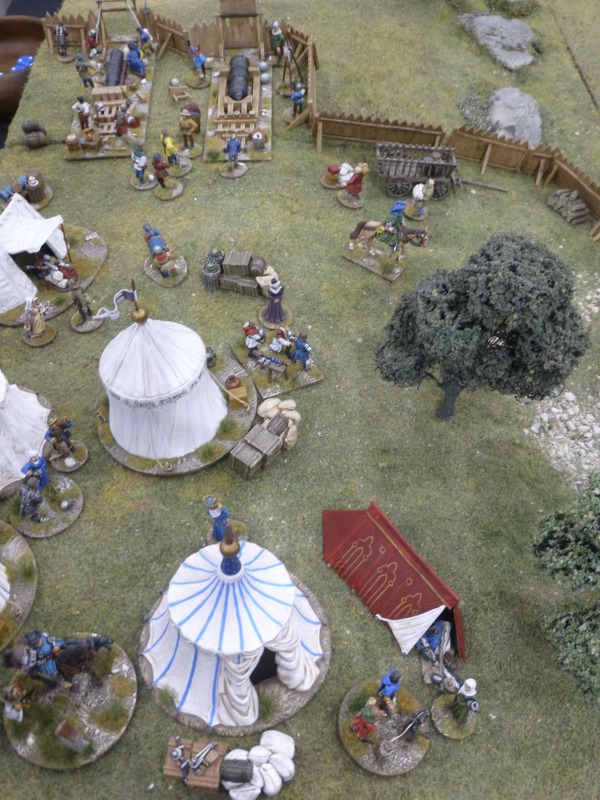 To round things off, some snapshots of other displays and participation games of the eras. 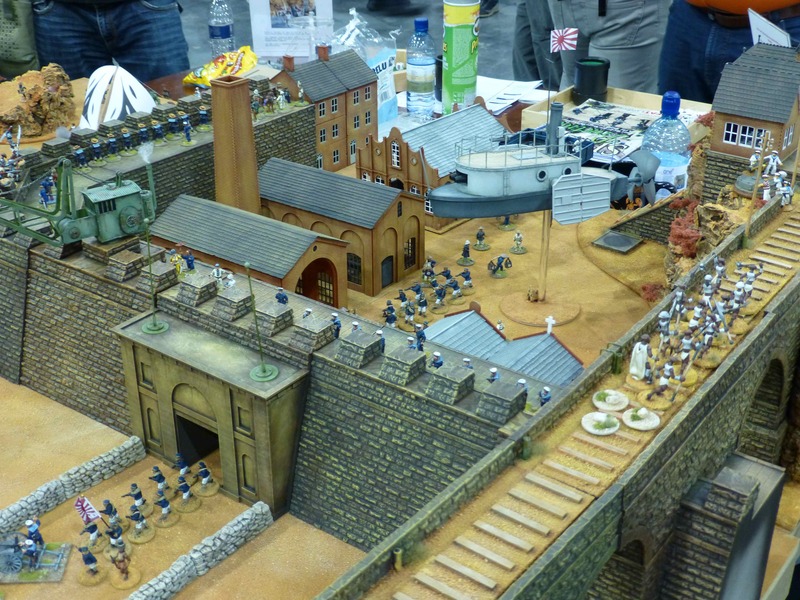 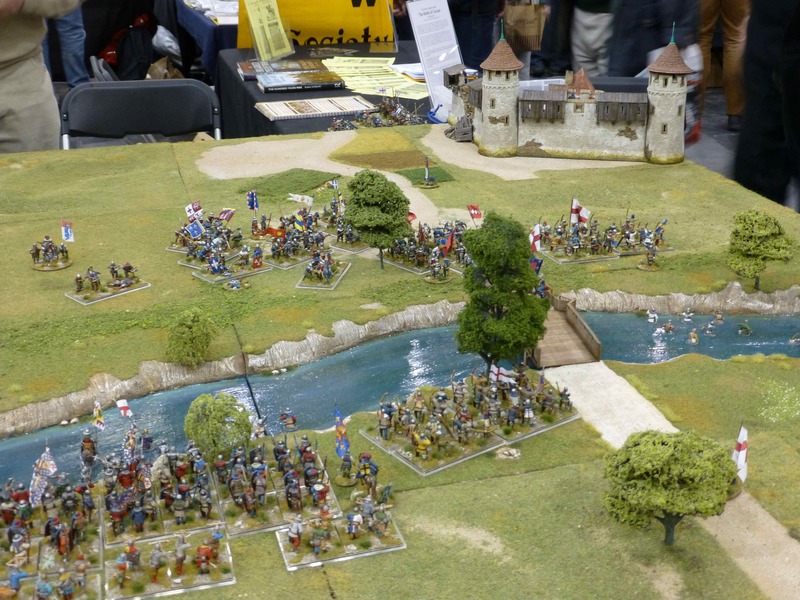 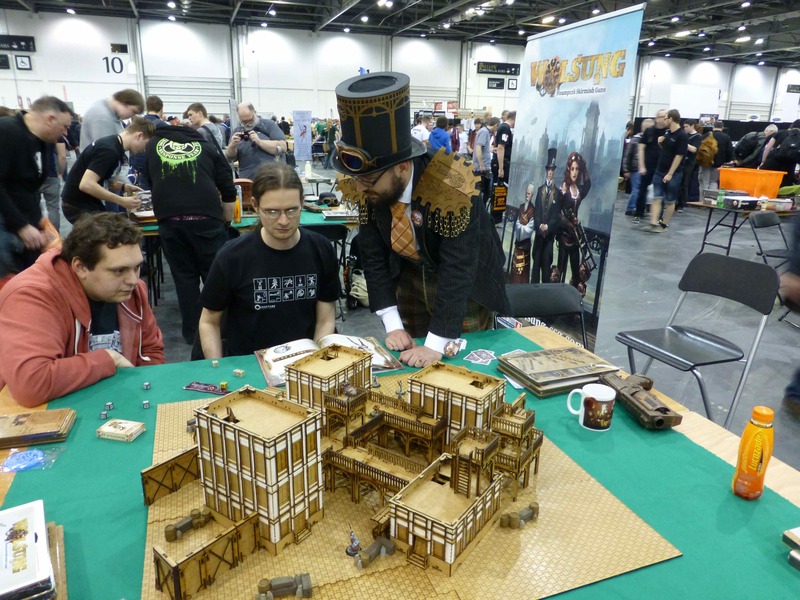 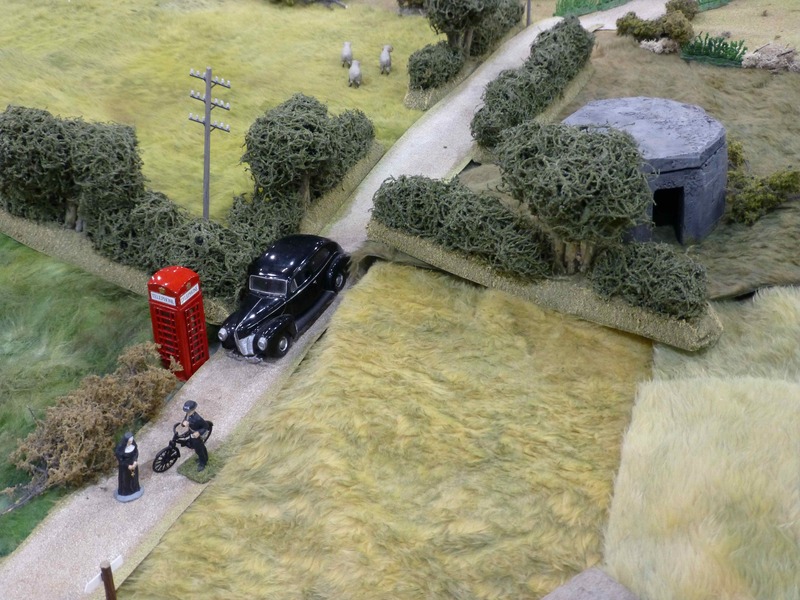 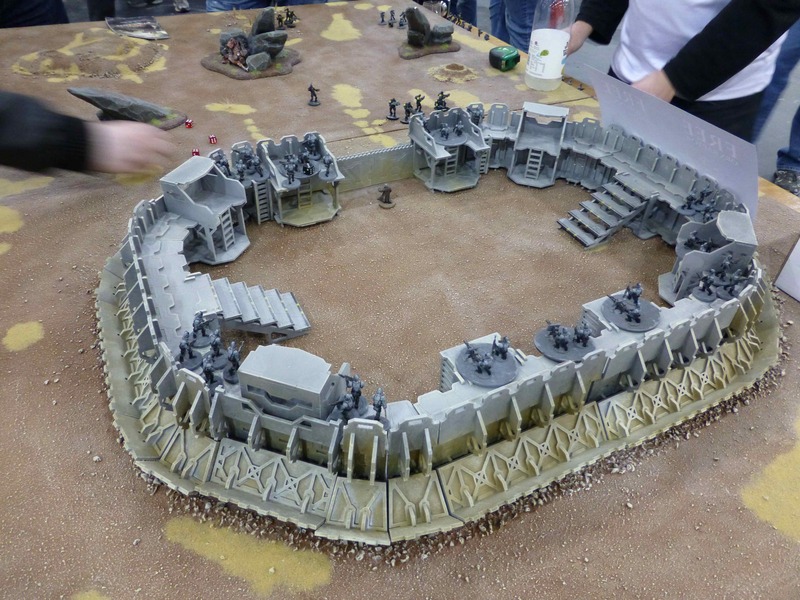 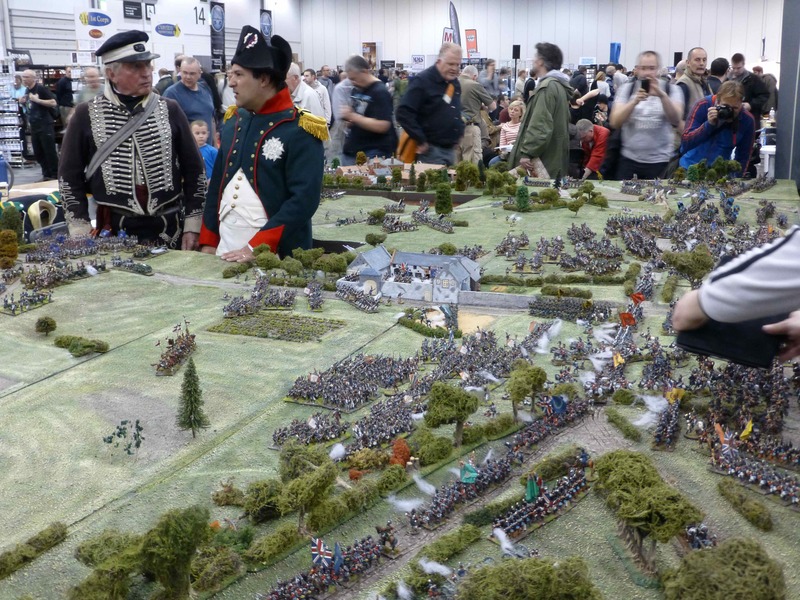 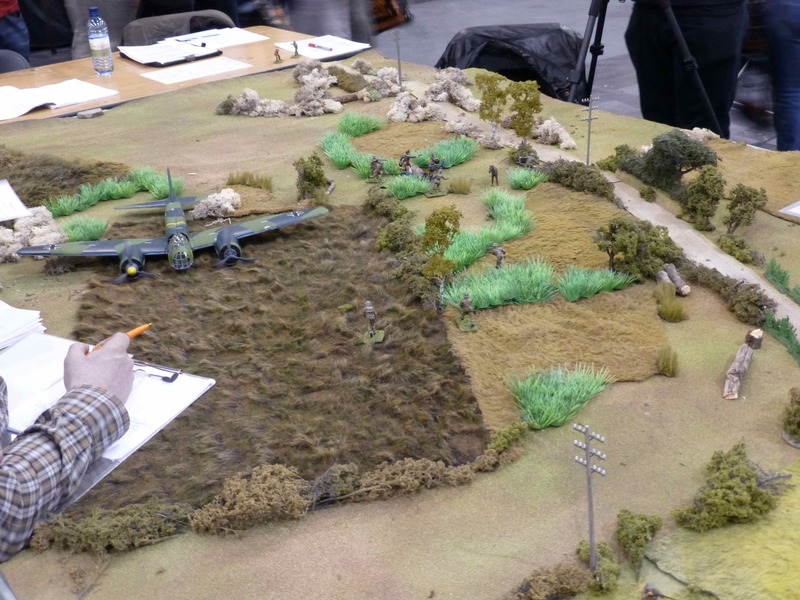 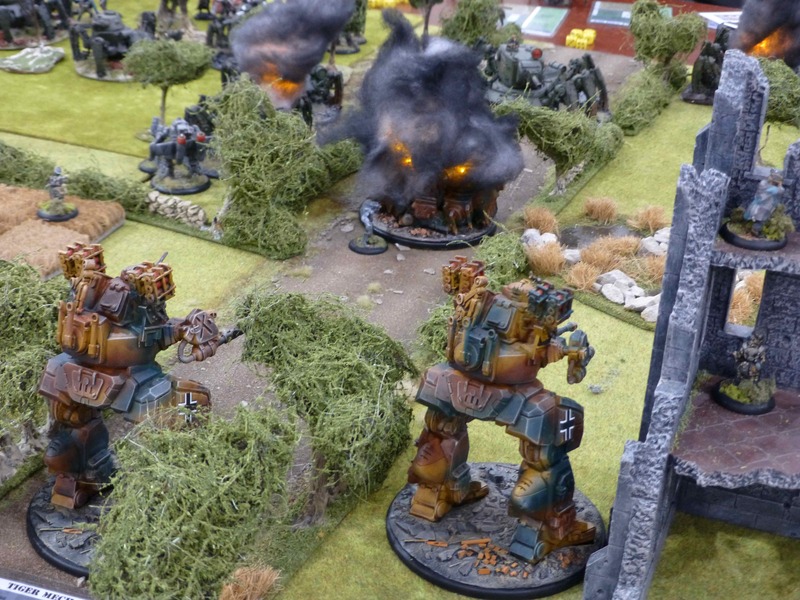 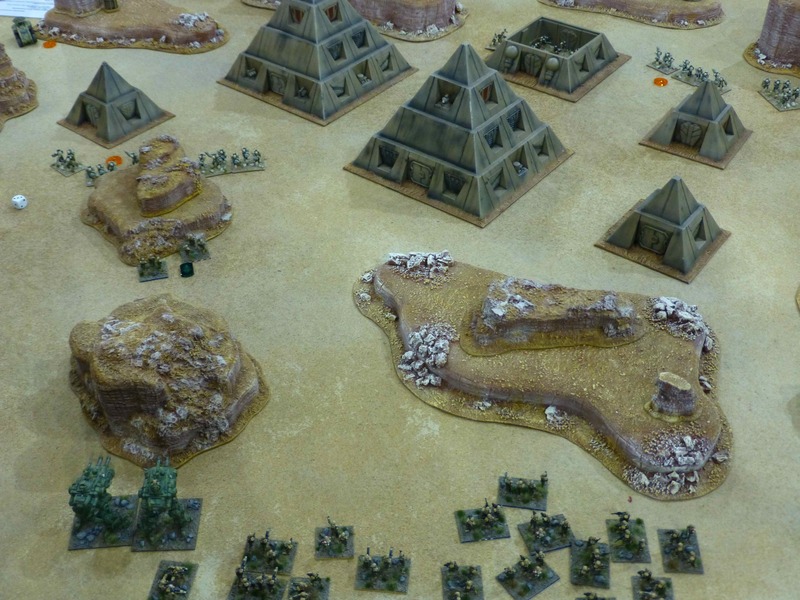 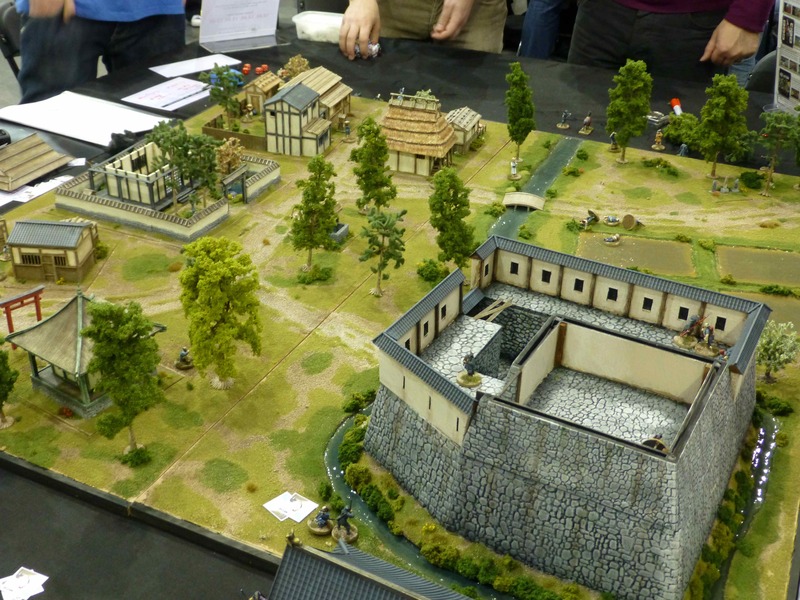 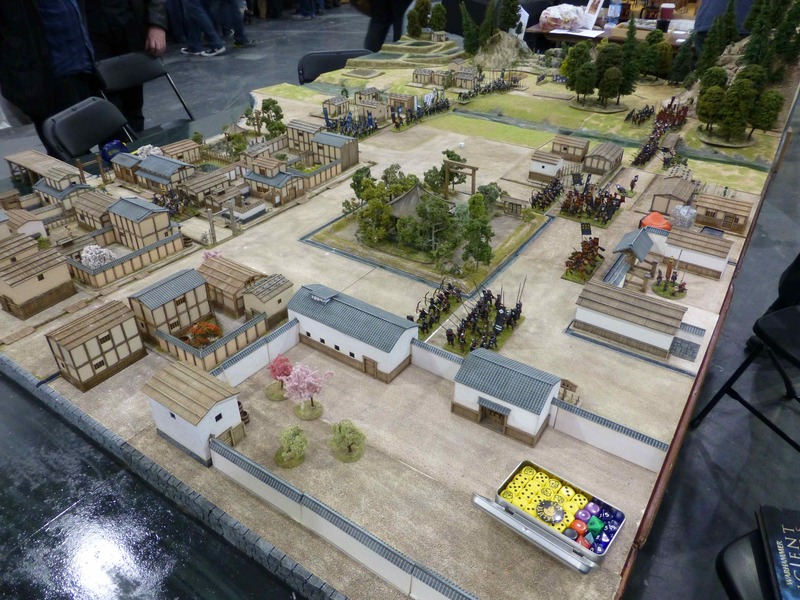 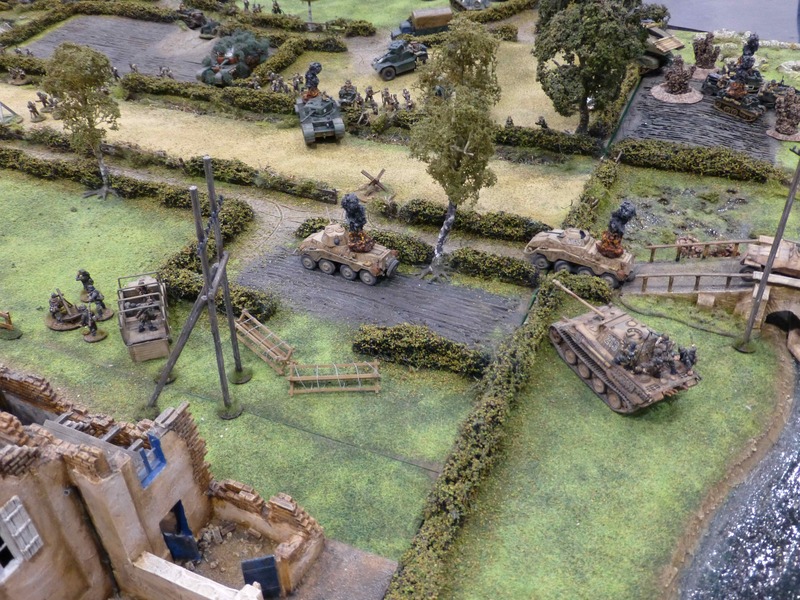 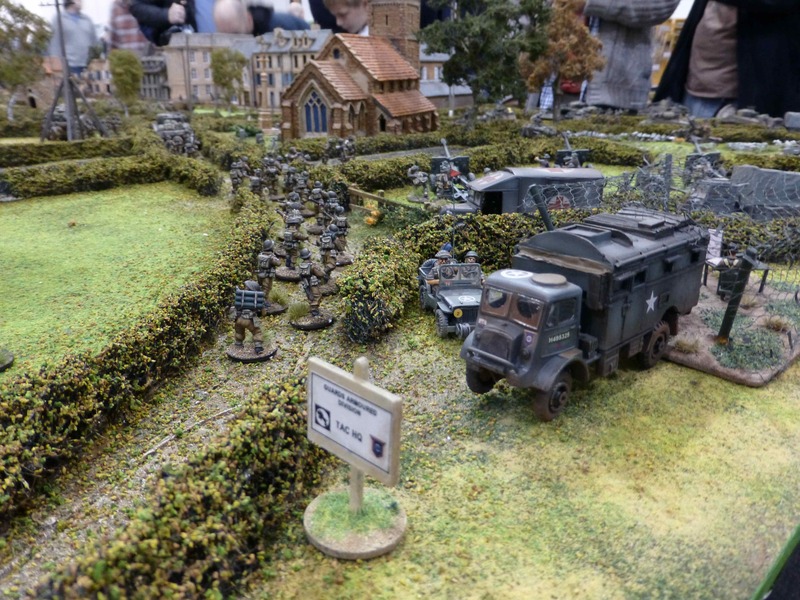 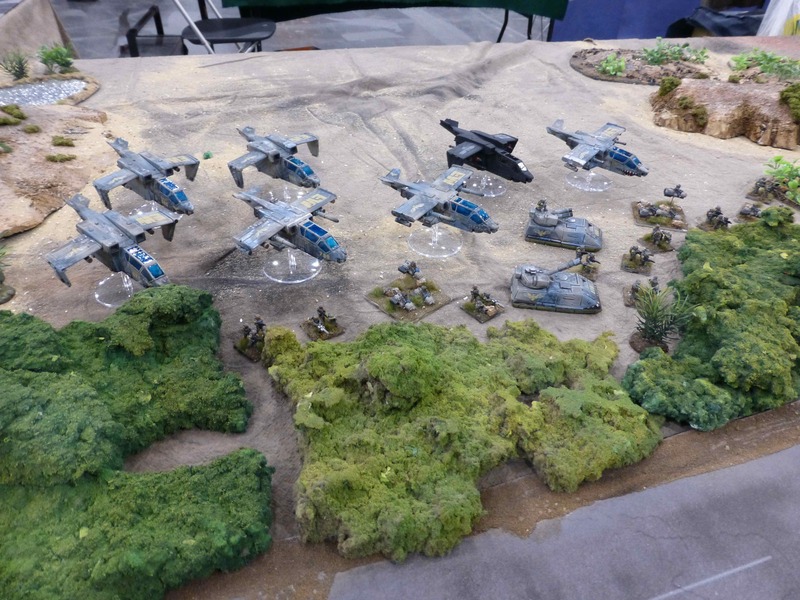 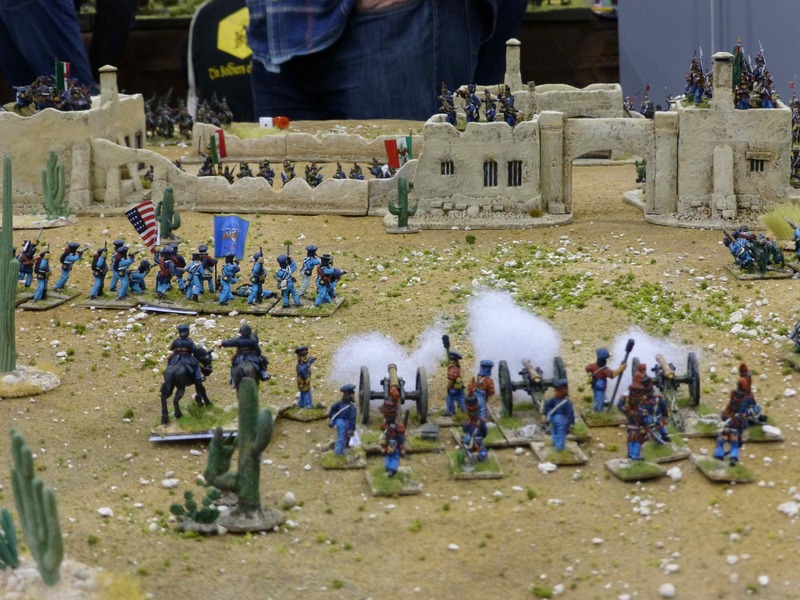 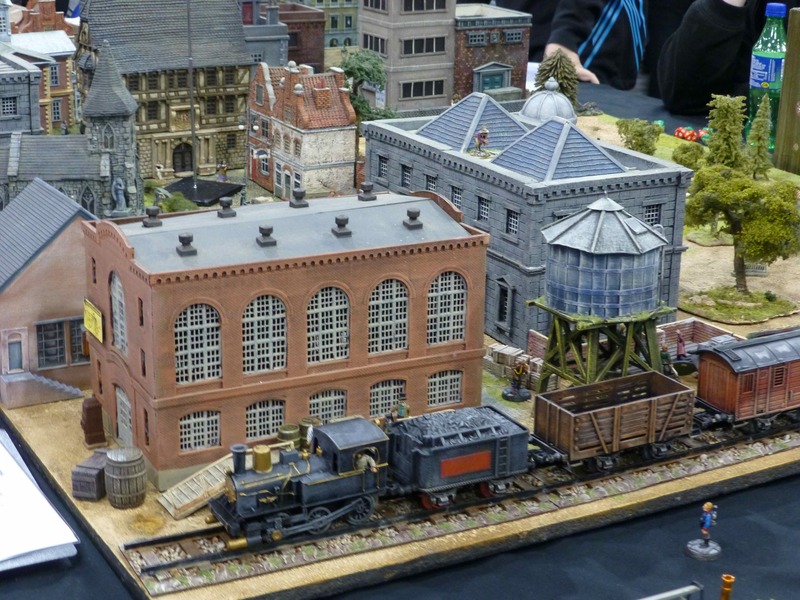 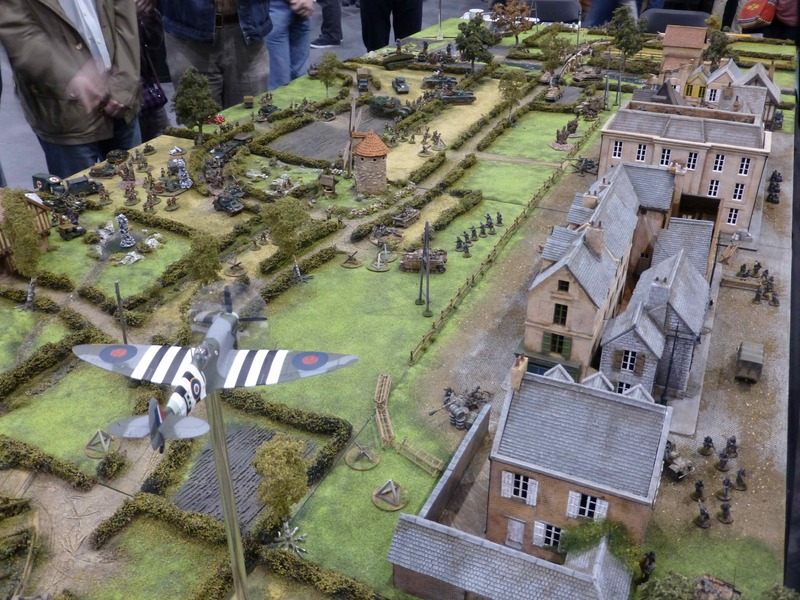 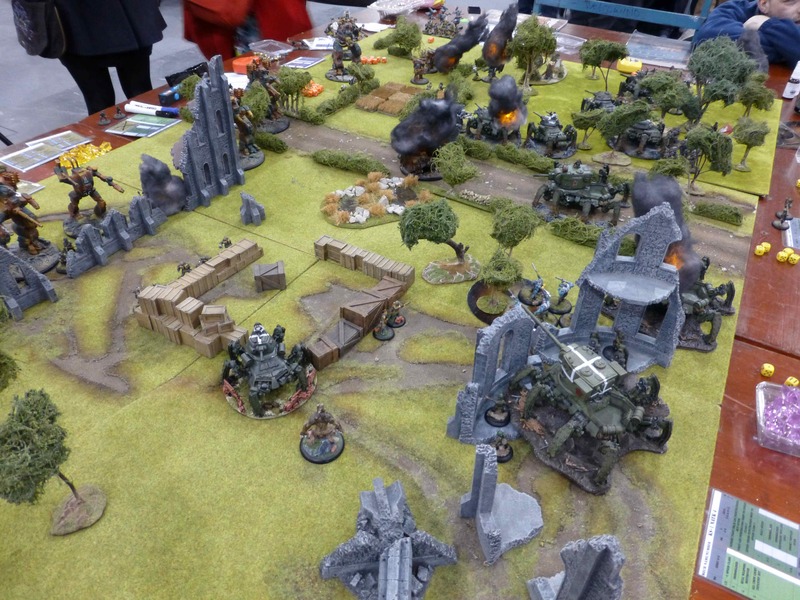 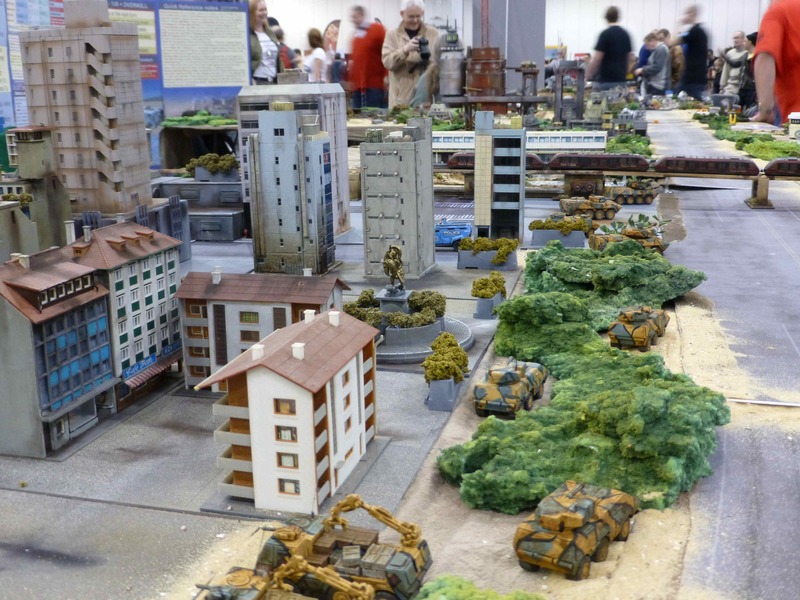 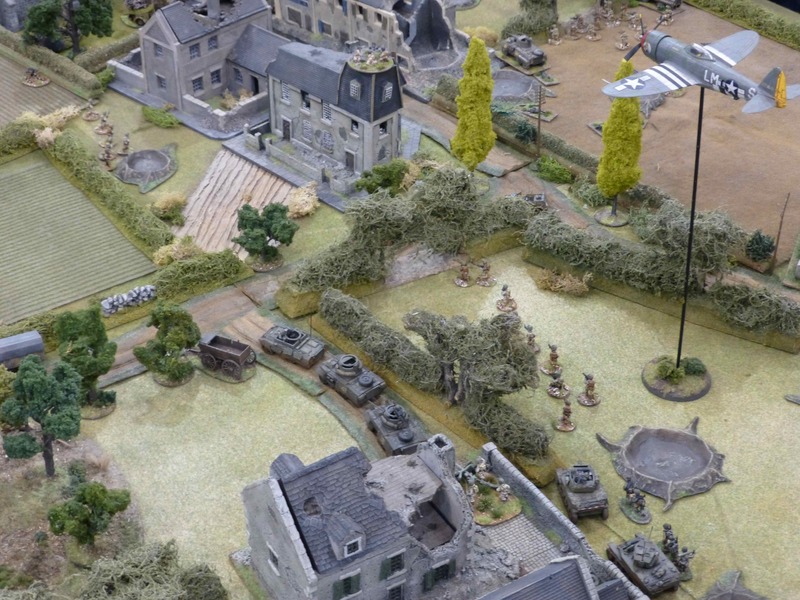 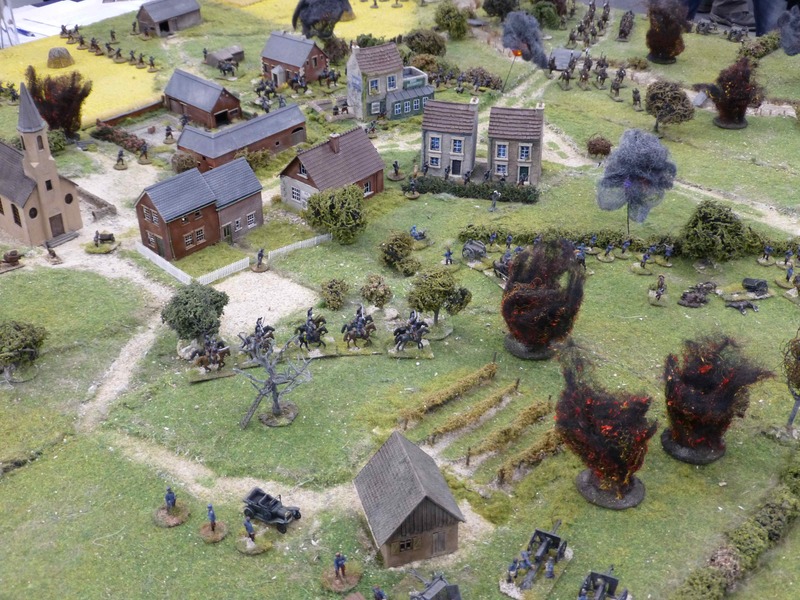 There were some amazing tables and forces for World War 2 wargaming at Salute 2013. 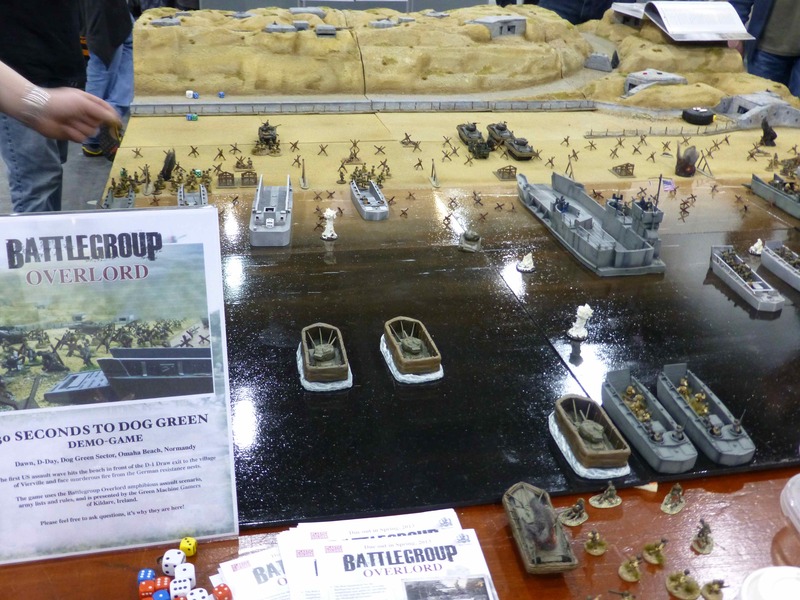 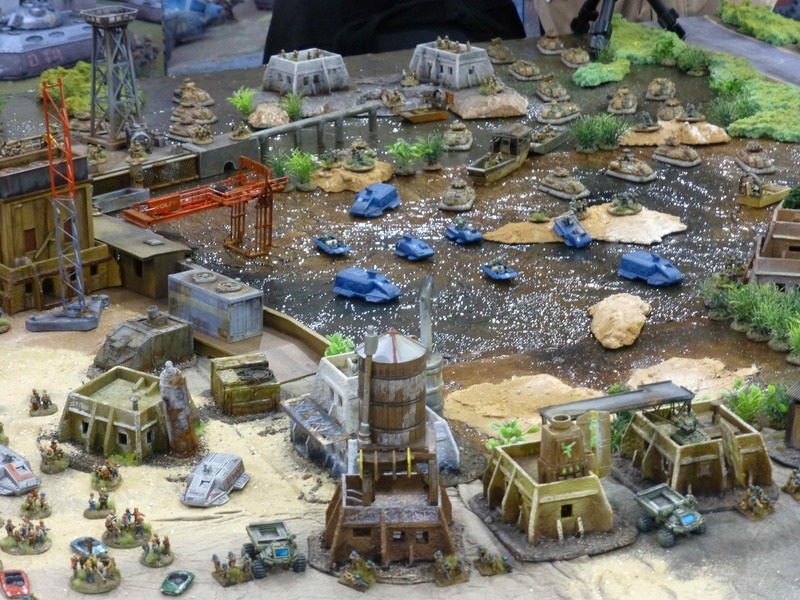 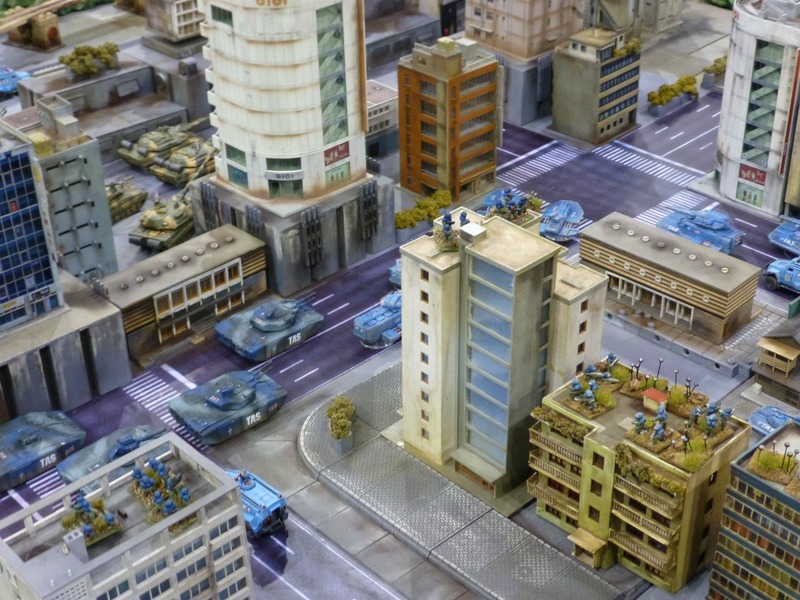 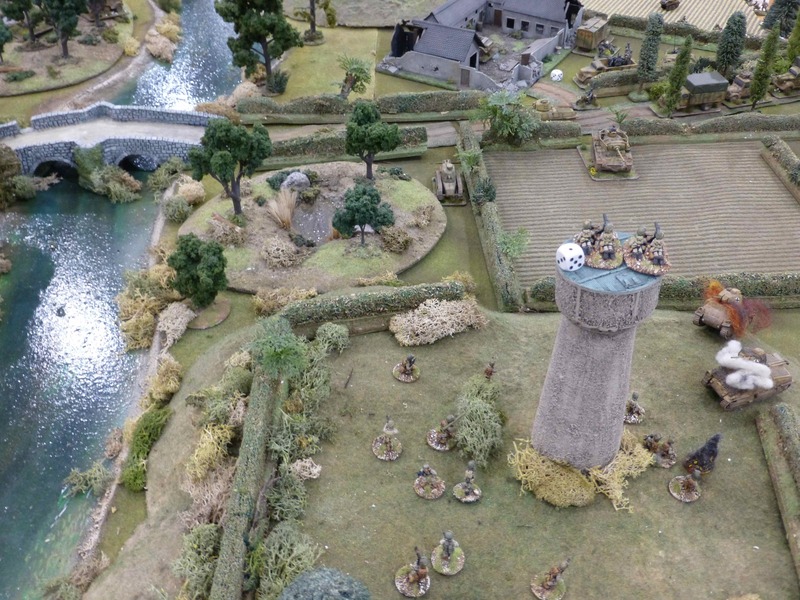 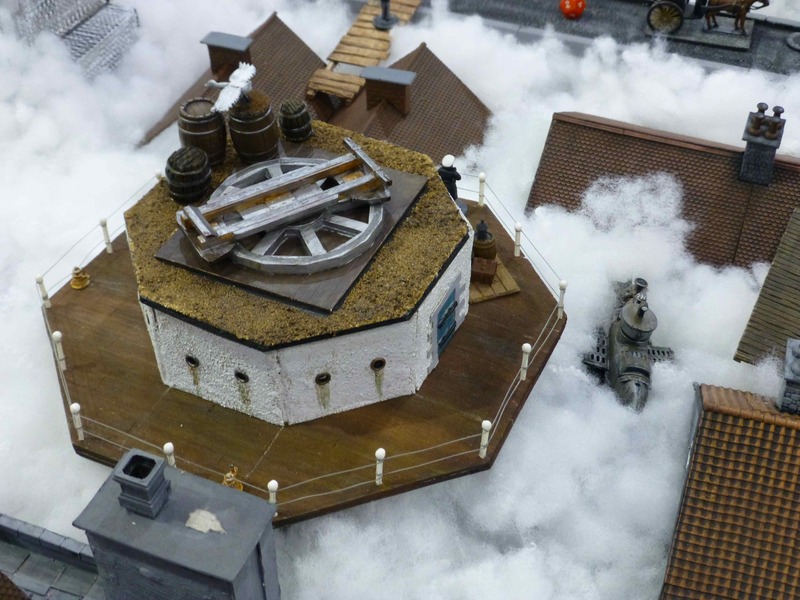 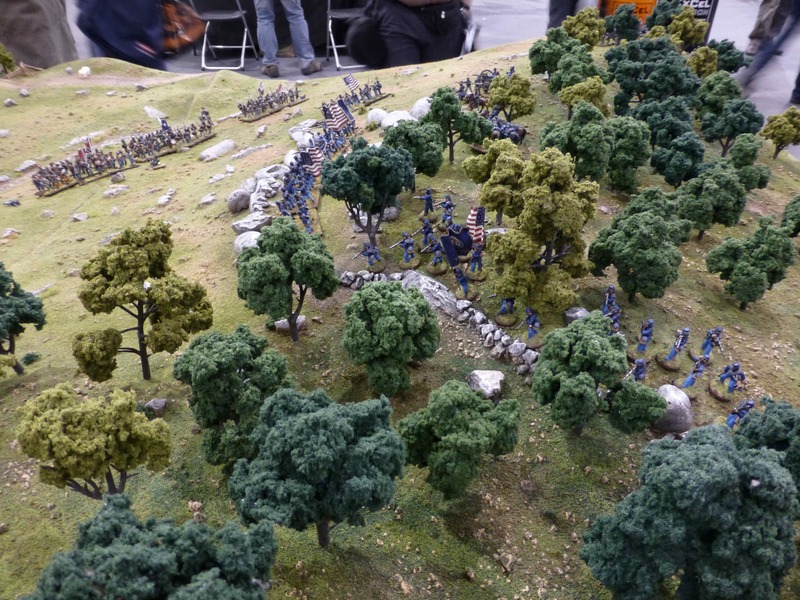 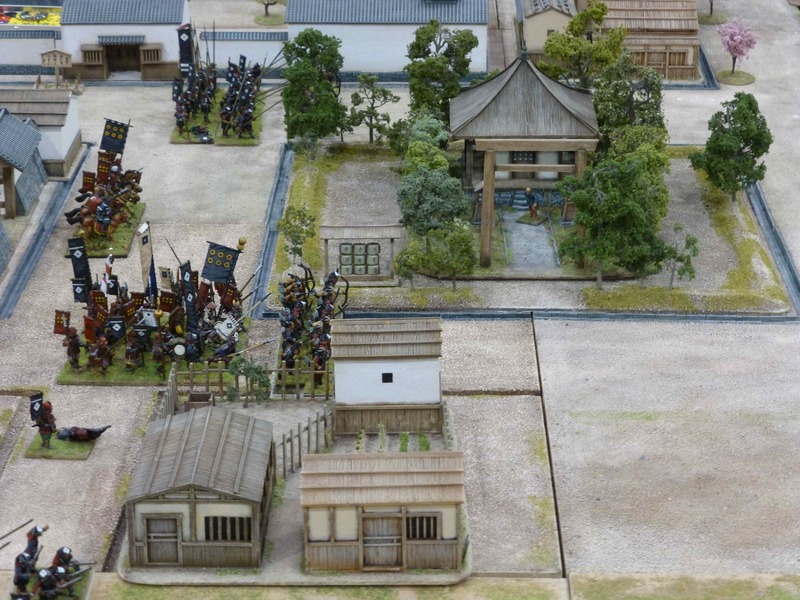 A great custom built shoreline was the setting for 30 Seconds to Dog Green, a Battlegroup Overlord demo game. 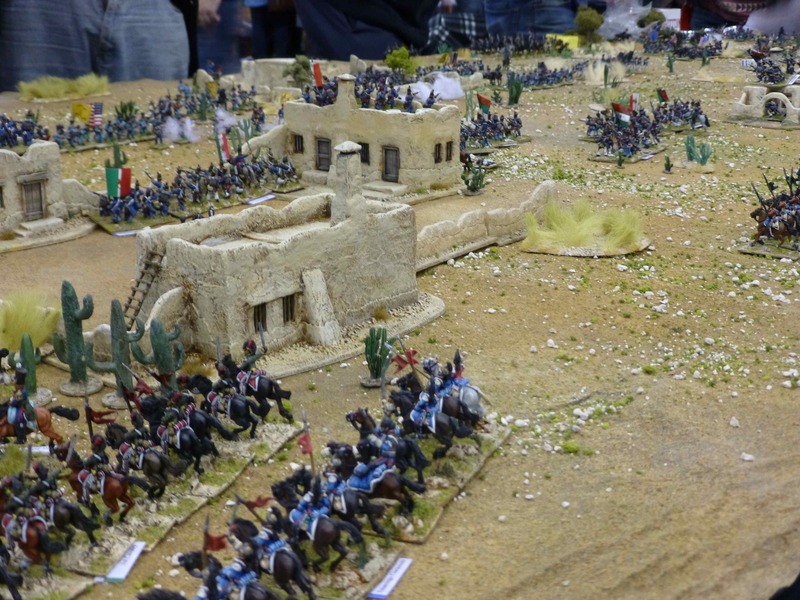 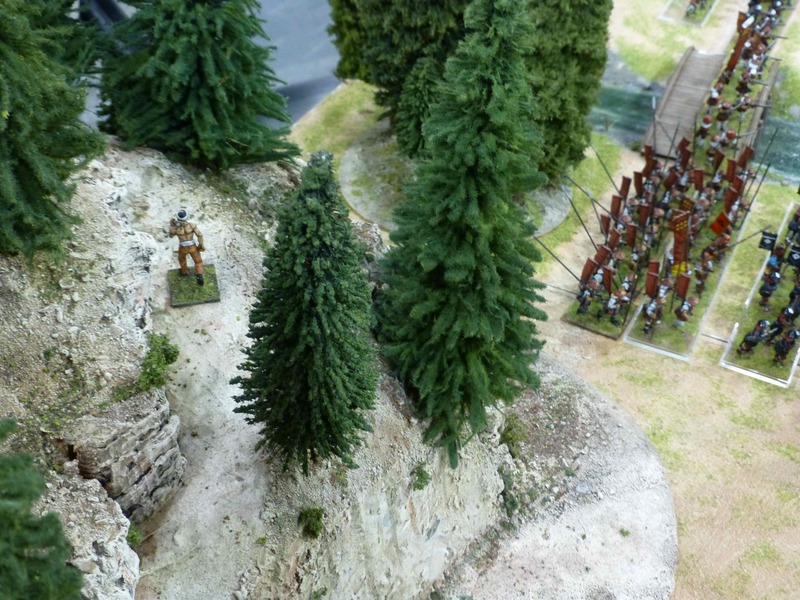 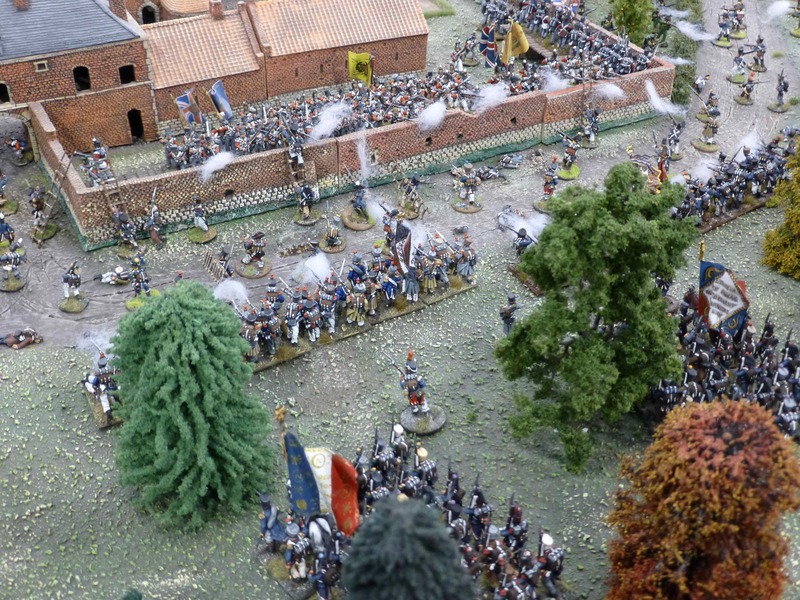 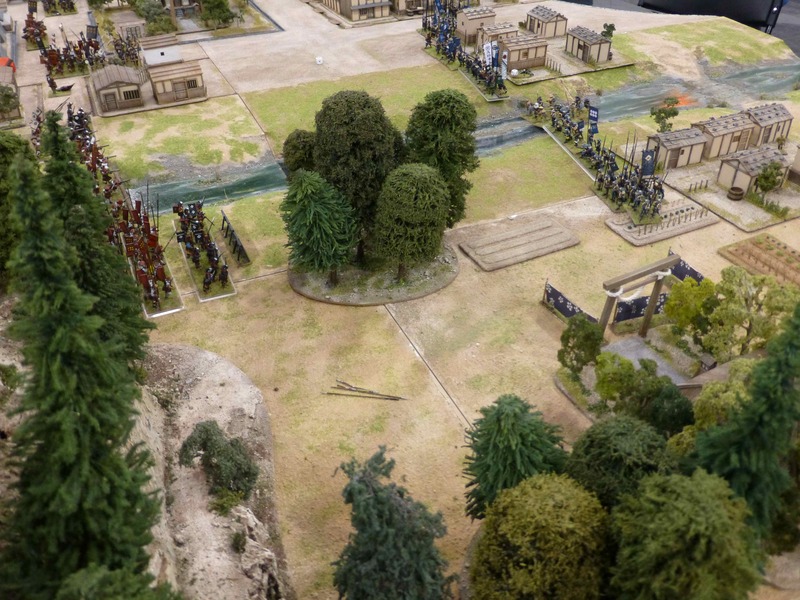 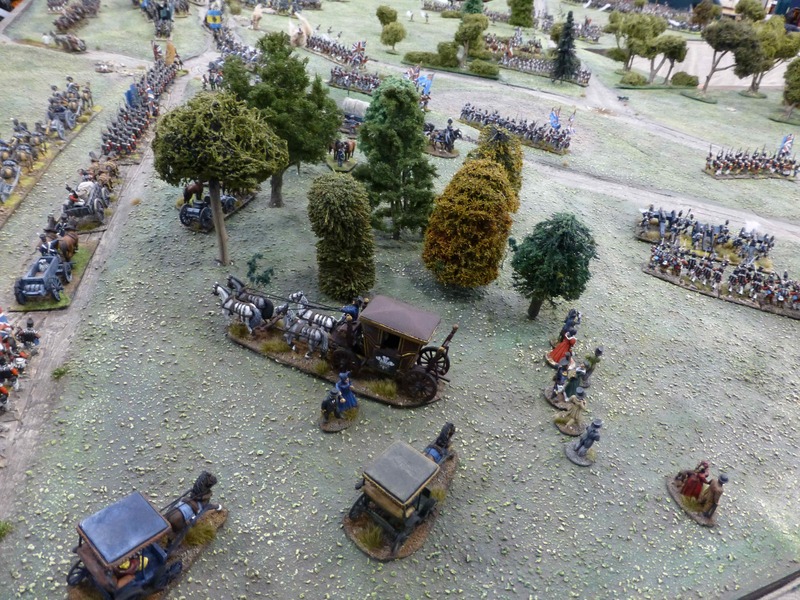 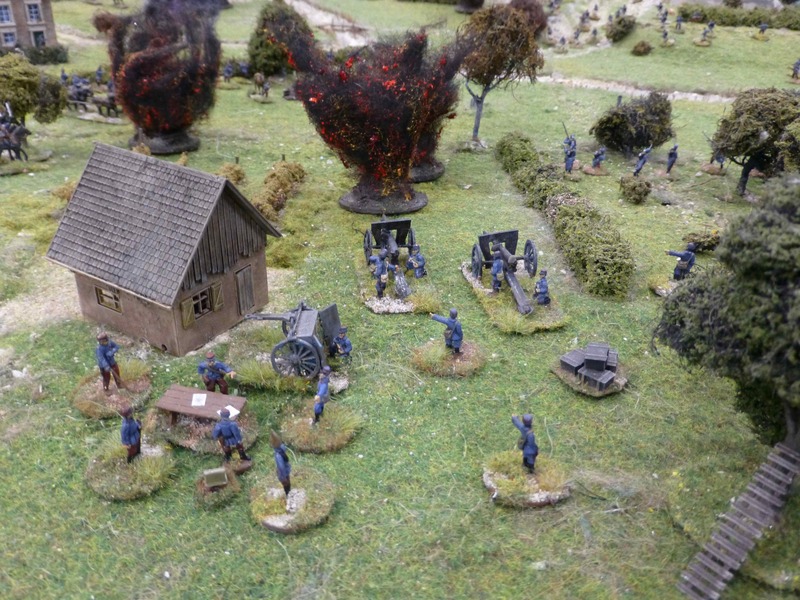 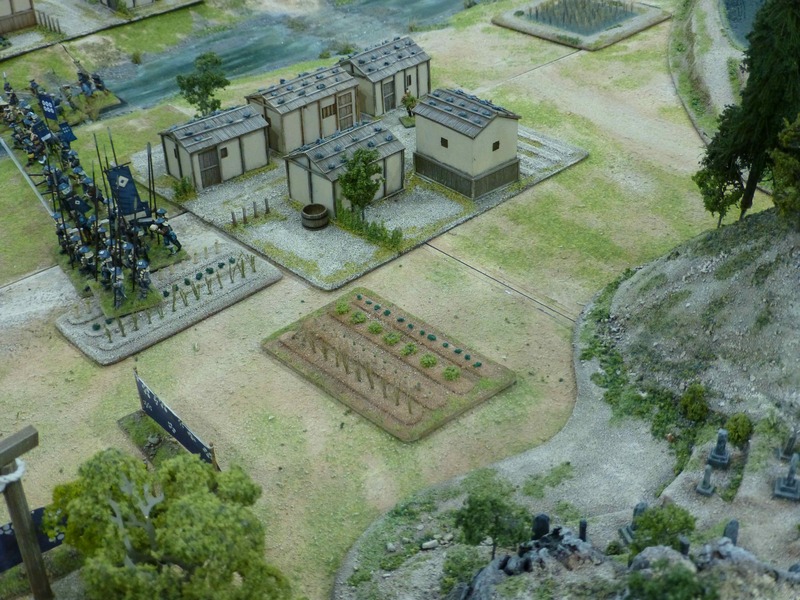 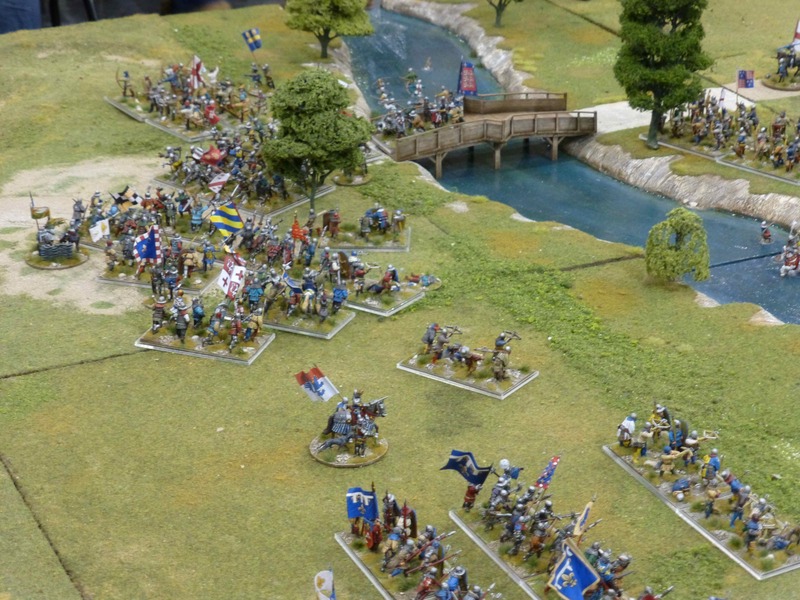 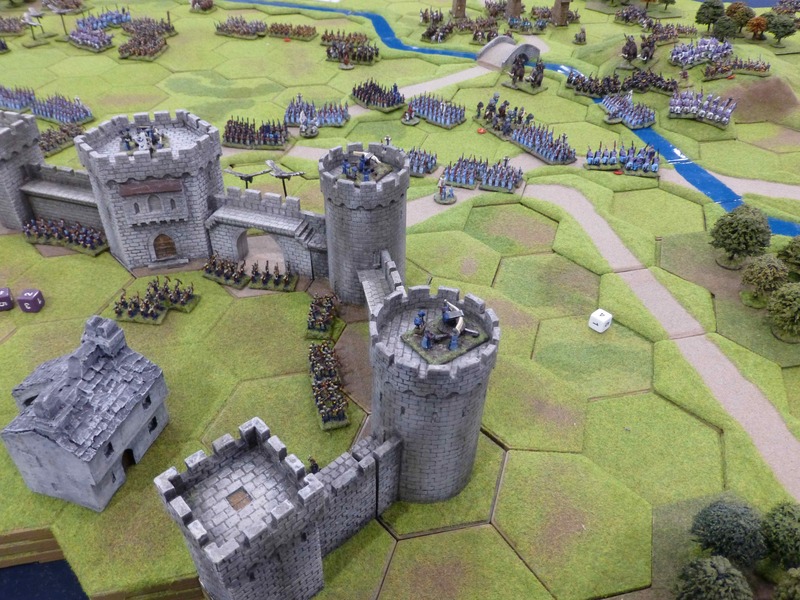 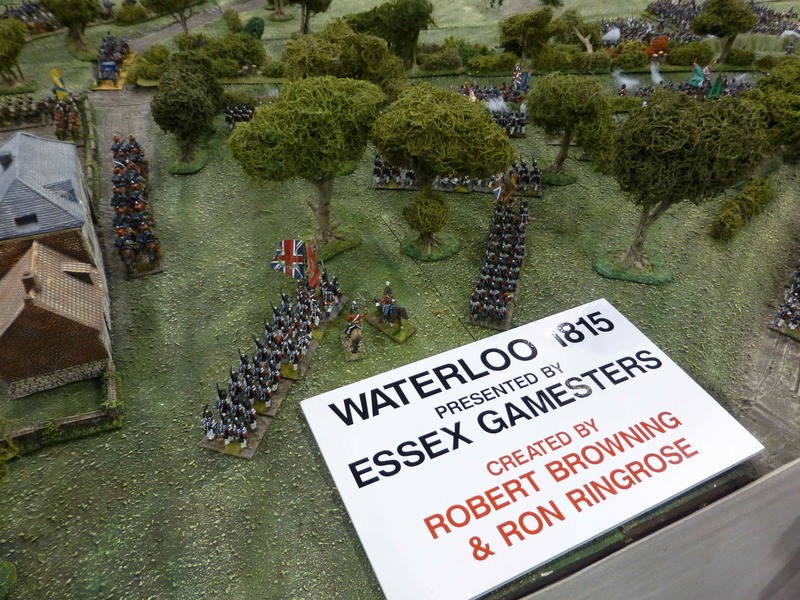 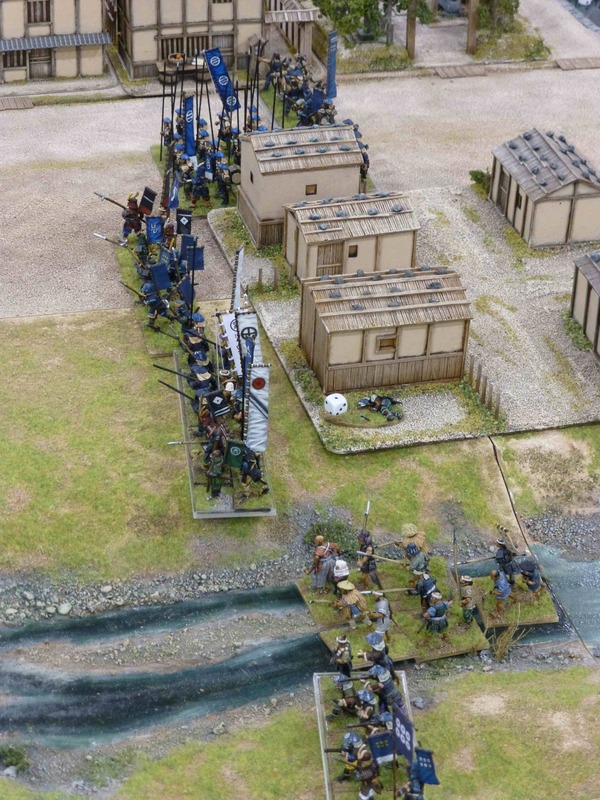 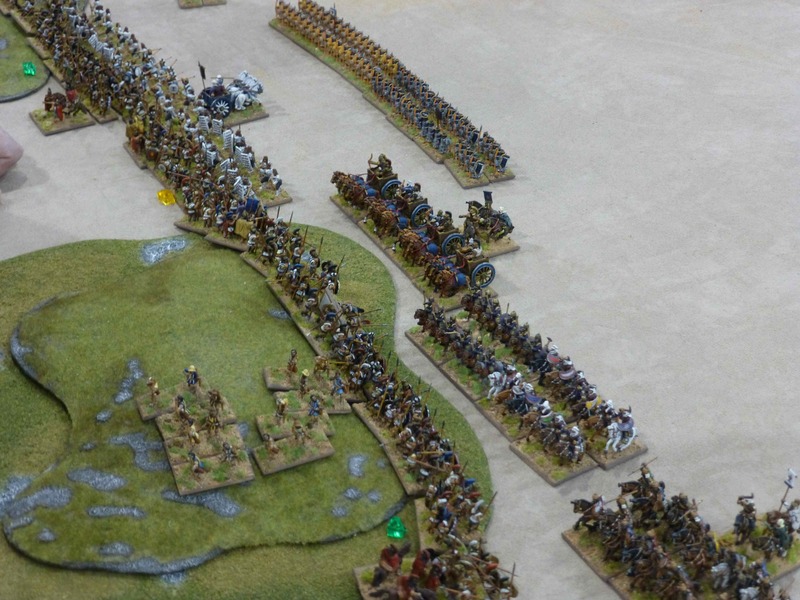 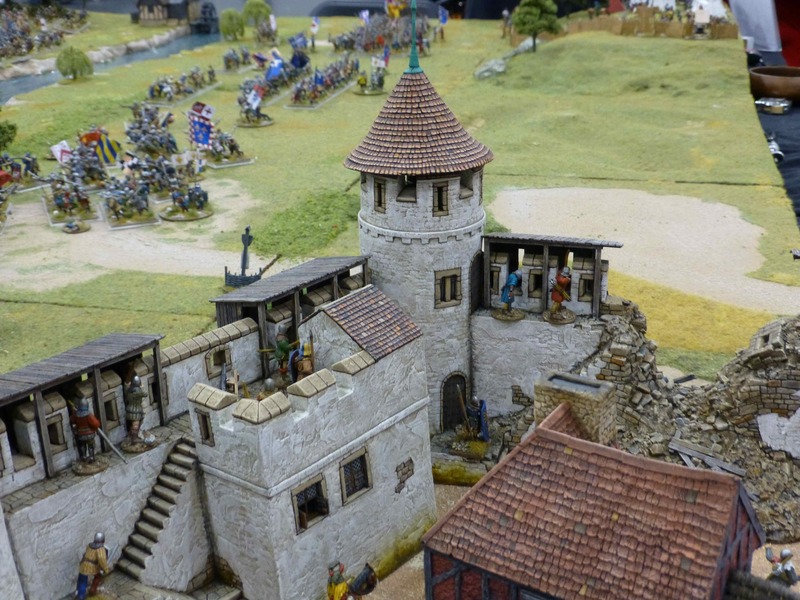 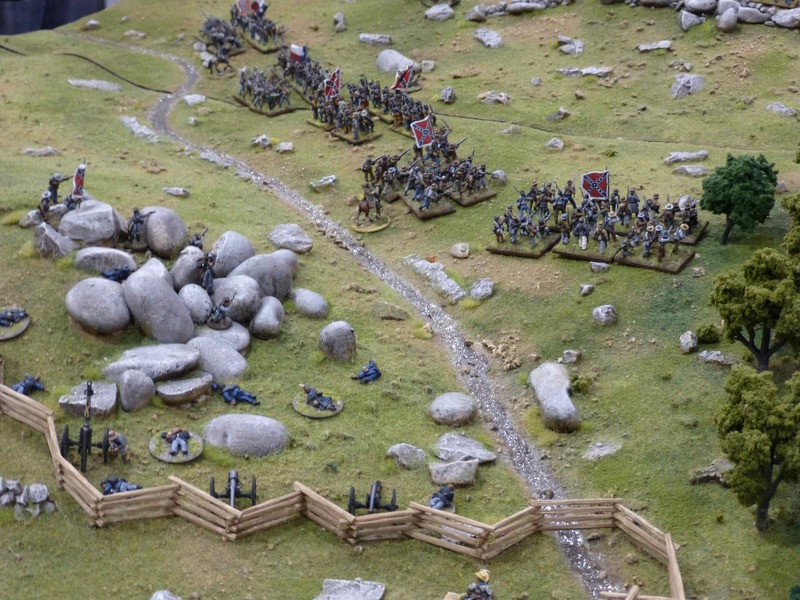 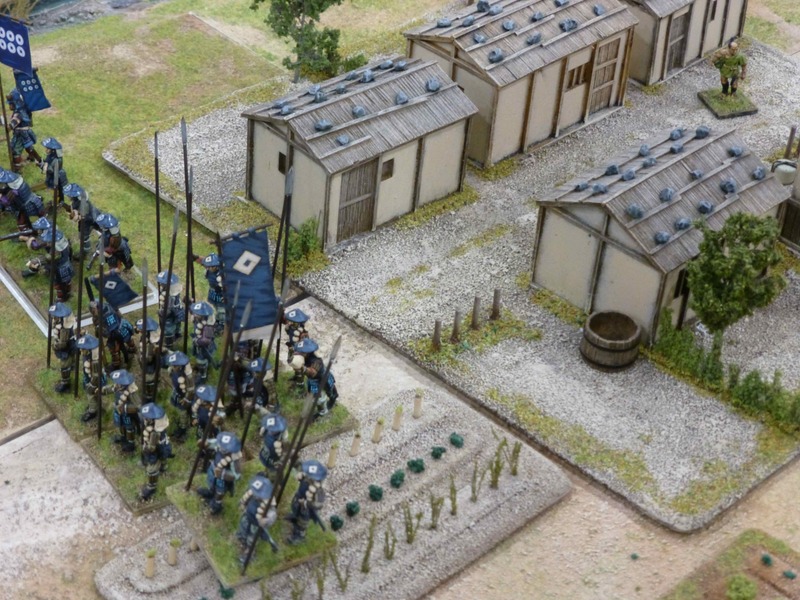 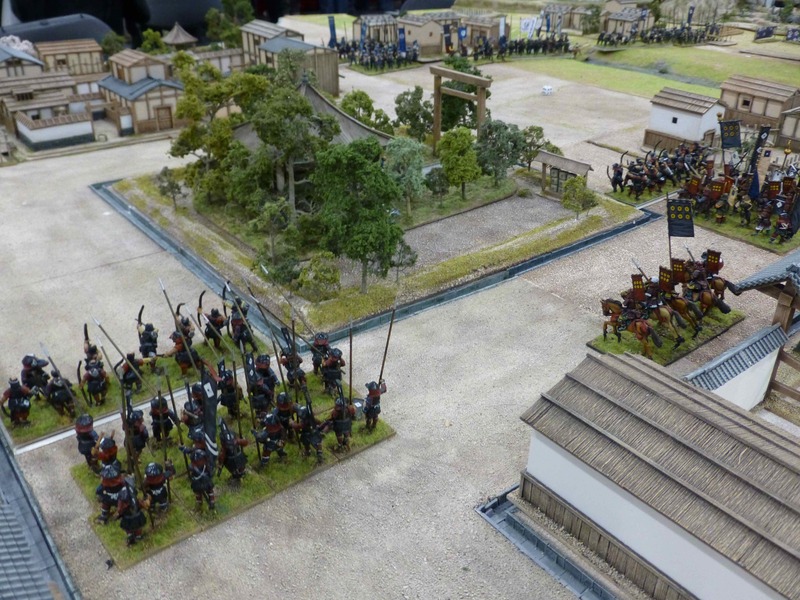 Unusual scale, unusual topic and unusual use of shaggy carpets: The Last Battle On English Soil by Skirmish Wargames. 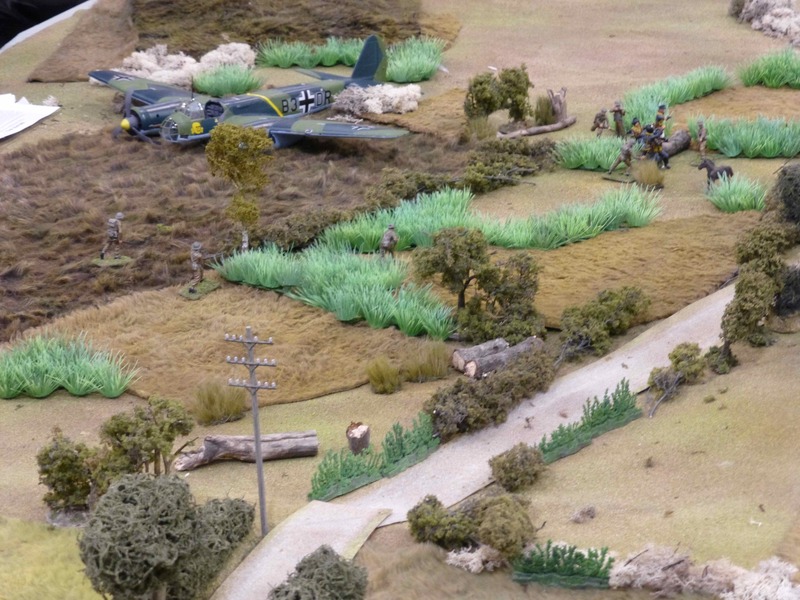 The fight that ensued when a downed German Ju88 bomber crew fought back! 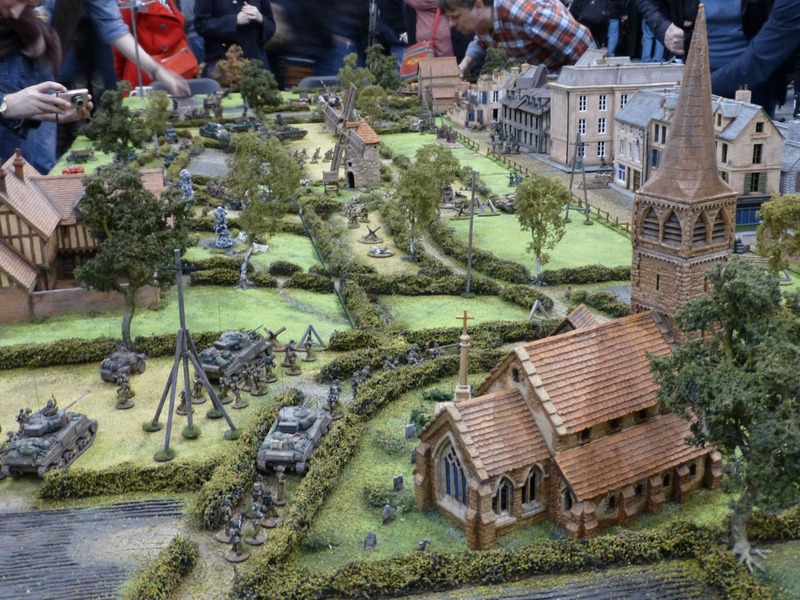 When Chaos Reigns by the Nantwich Gamers, using the Kampfgruppe Normandy rules. 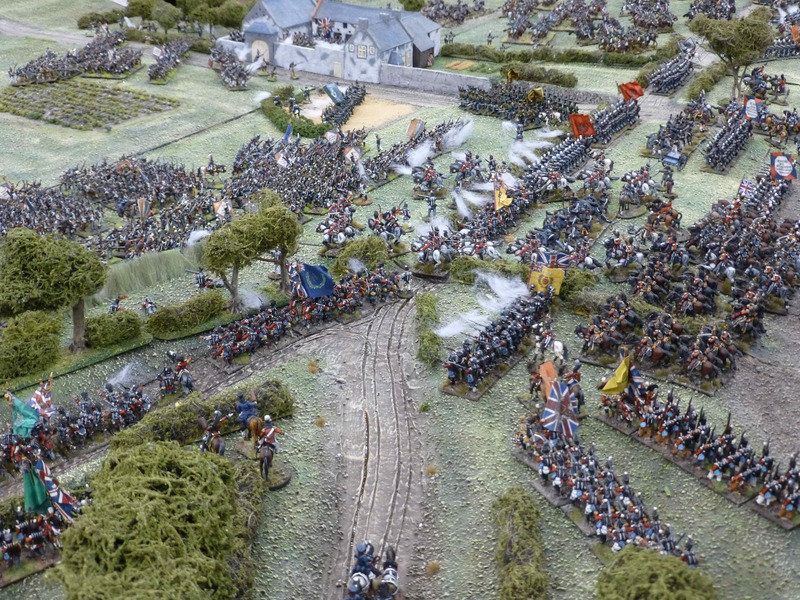 Grenadier Guards and King’s Shropshire Light Infantry with armour support assault over the River Orne into a large French town defended by experienced German infantry and armour. 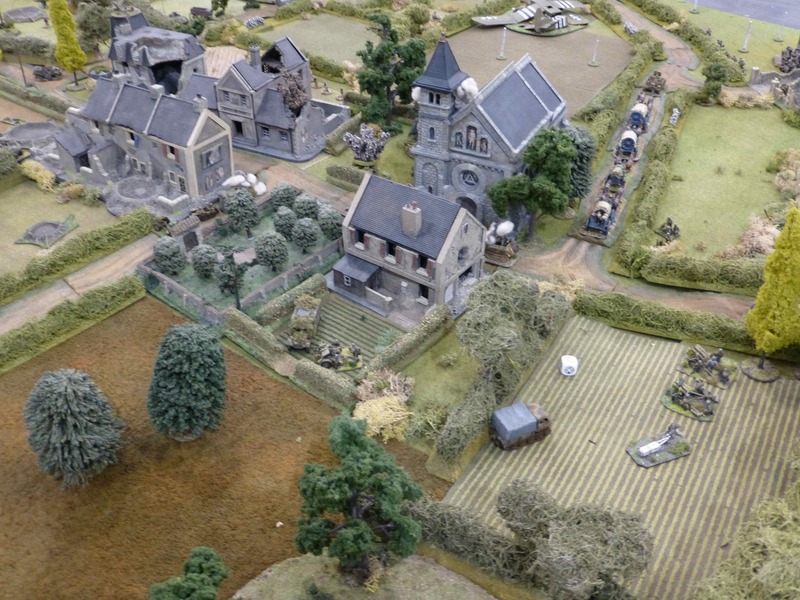 Inland From Utah, another Normandy setting for a game of Battlegroup Overlord.